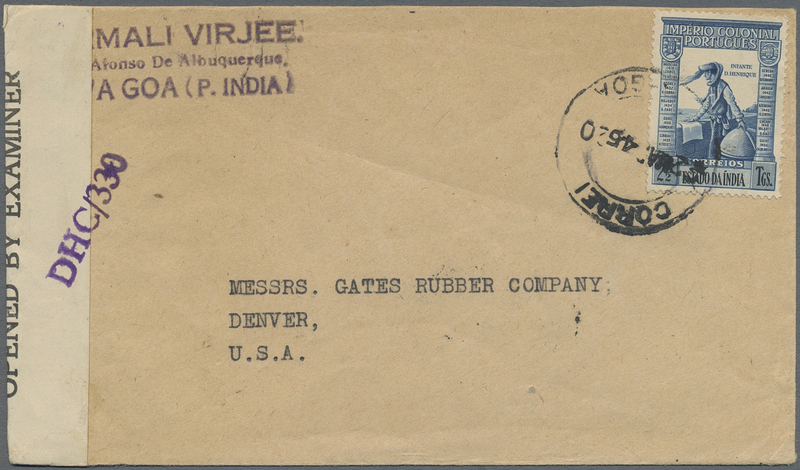 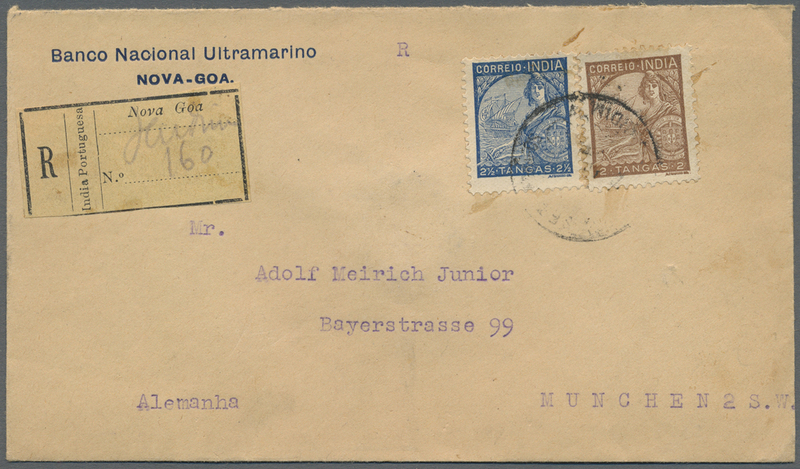 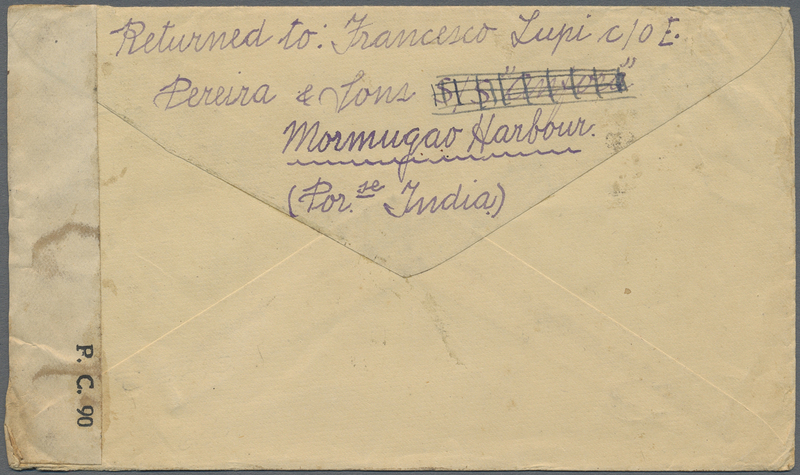 9572 Flugpostbrief (Flight cover) 385-88 1935-1937, two registered covers from Nova Goa to Munich, Germany as 1) 1935 printed envelopes (incl. 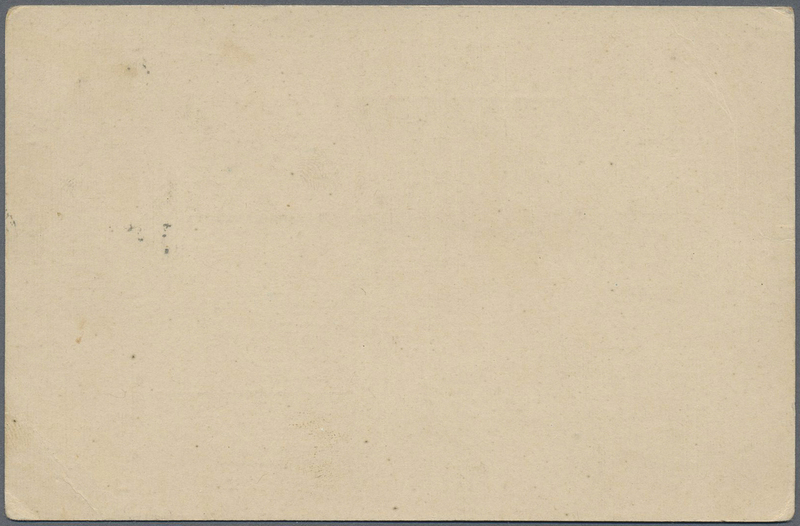 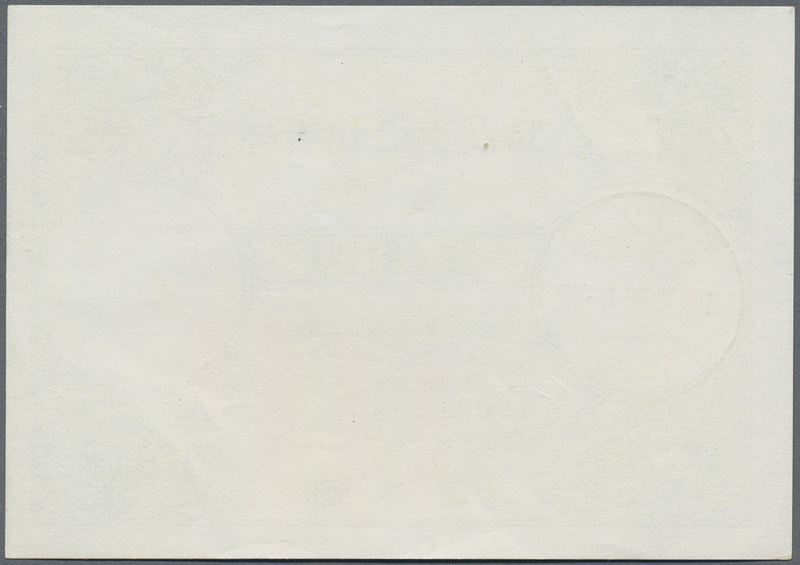 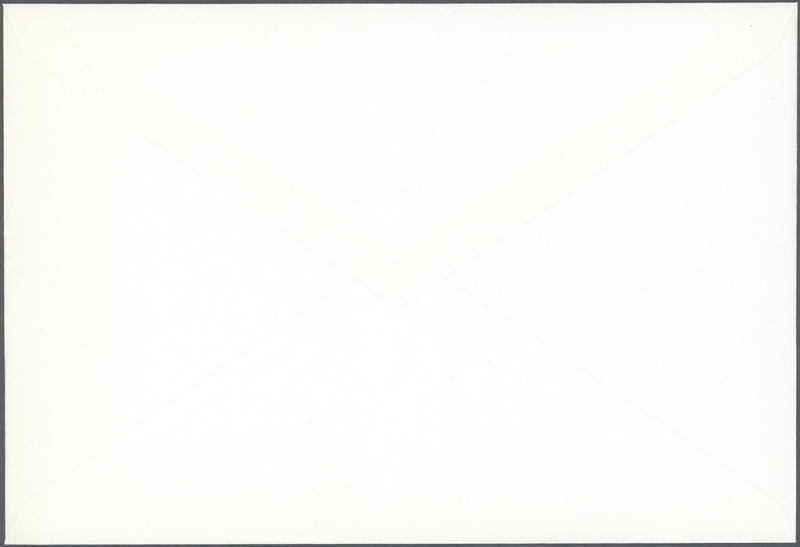 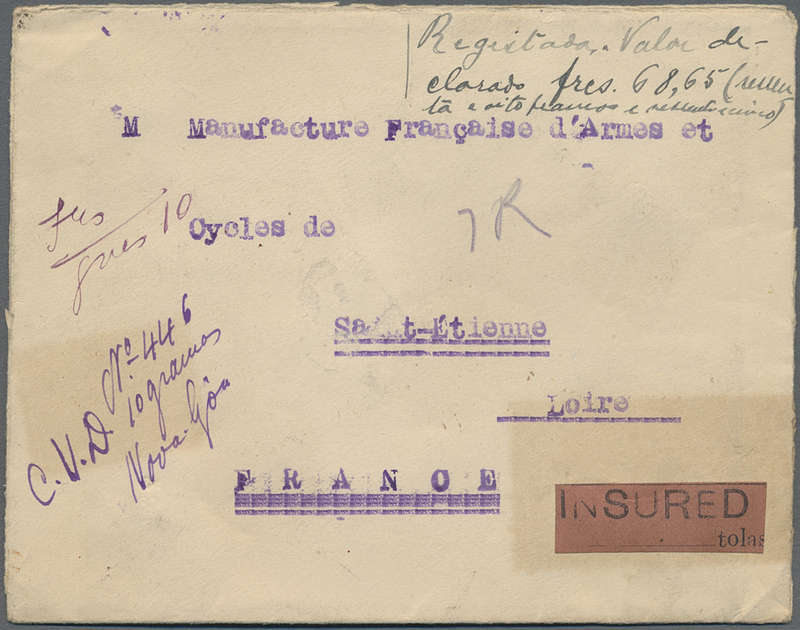 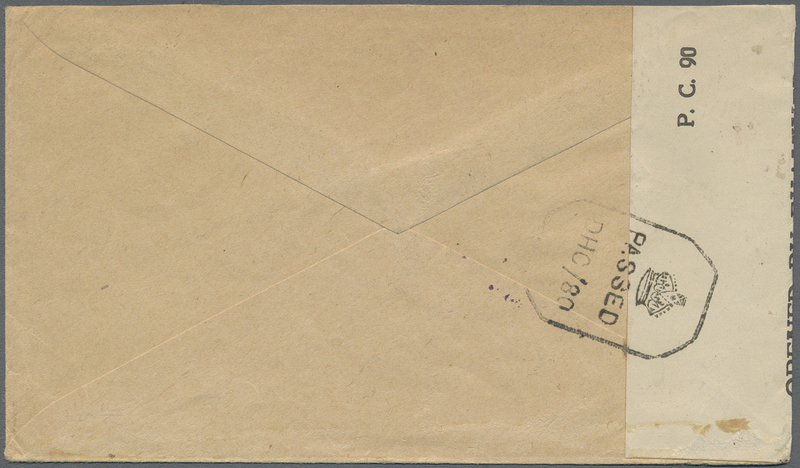 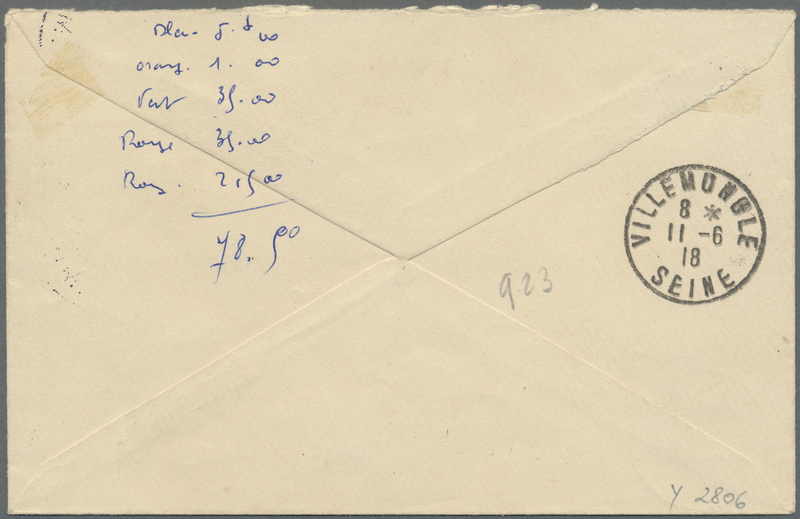 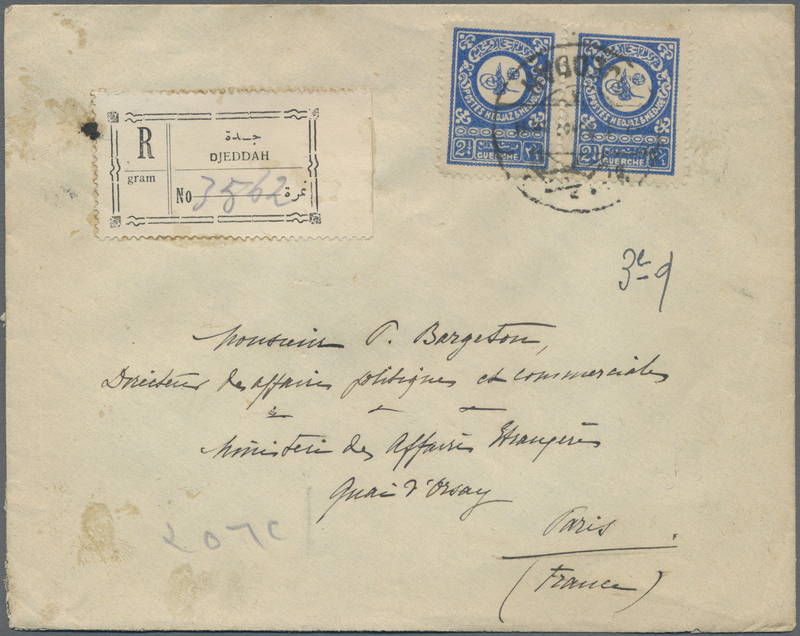 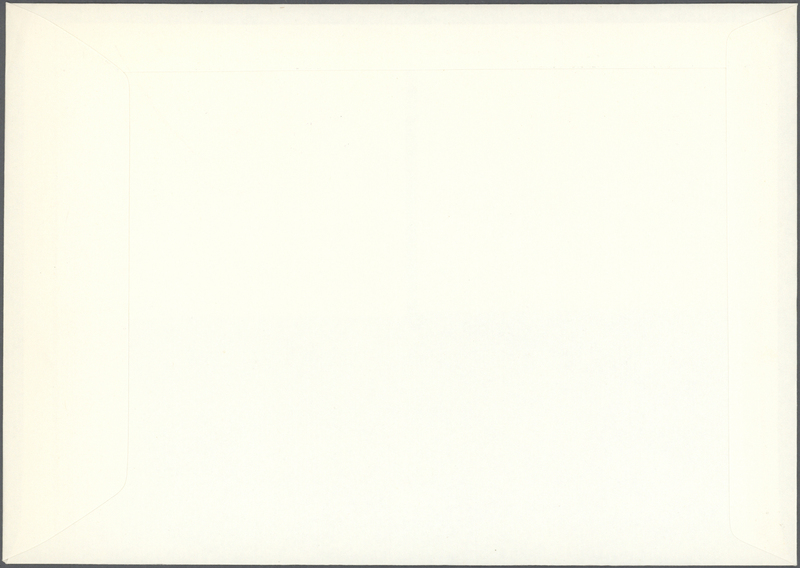 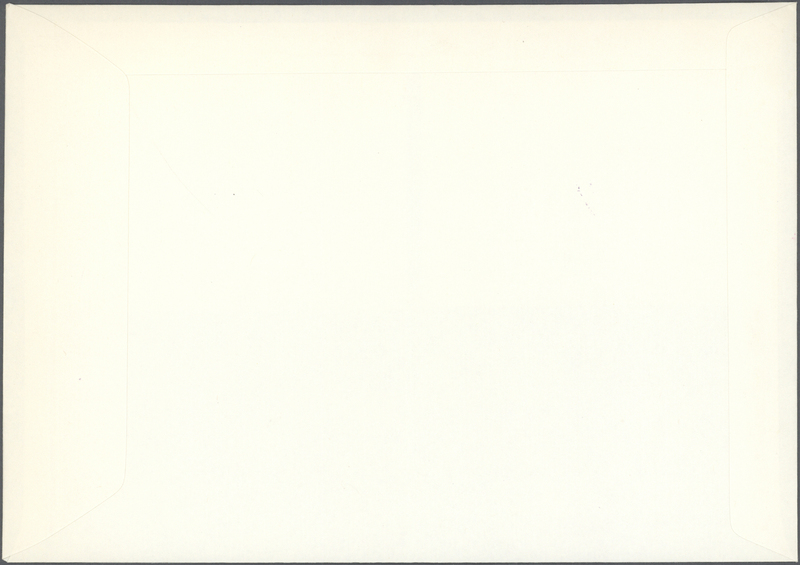 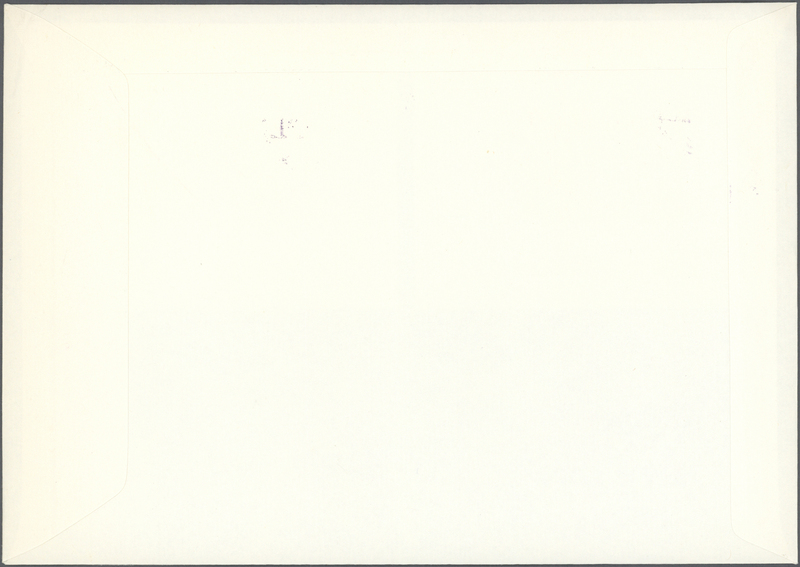 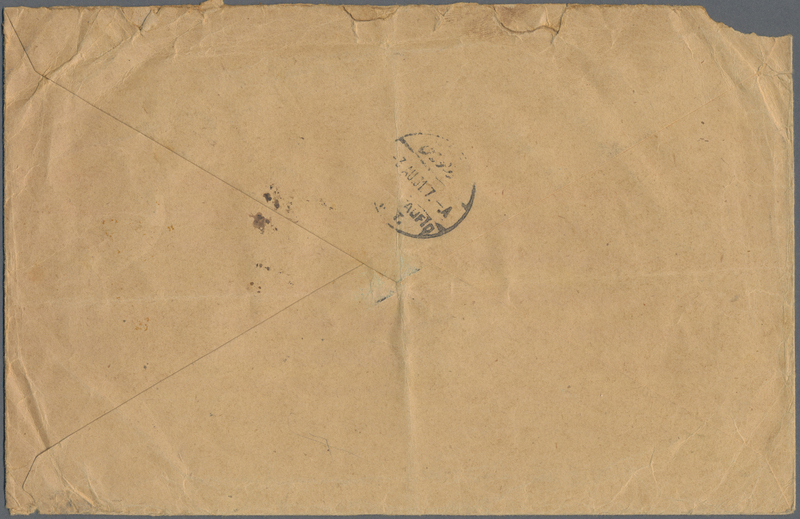 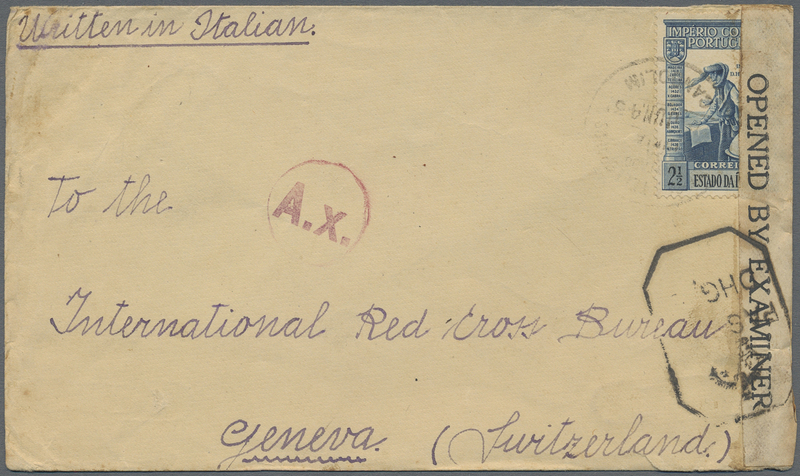 airplane on back) franked 1933 1½t. 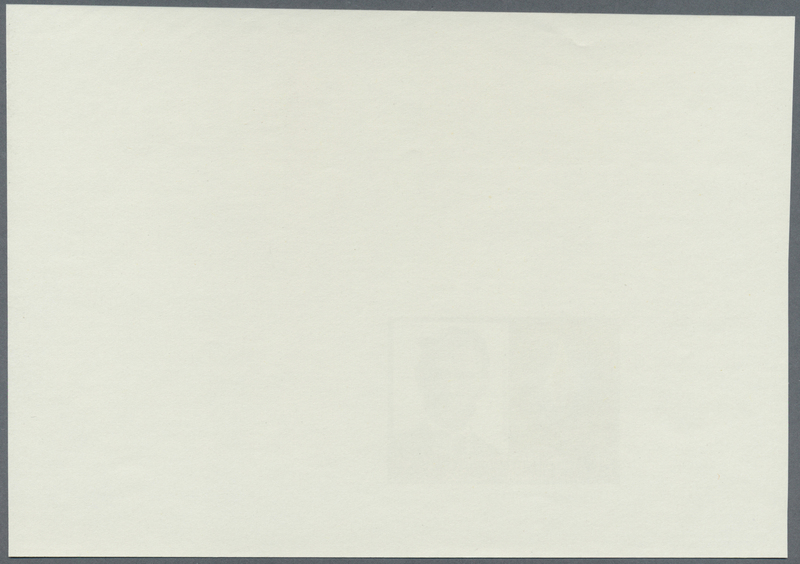 and 3t. 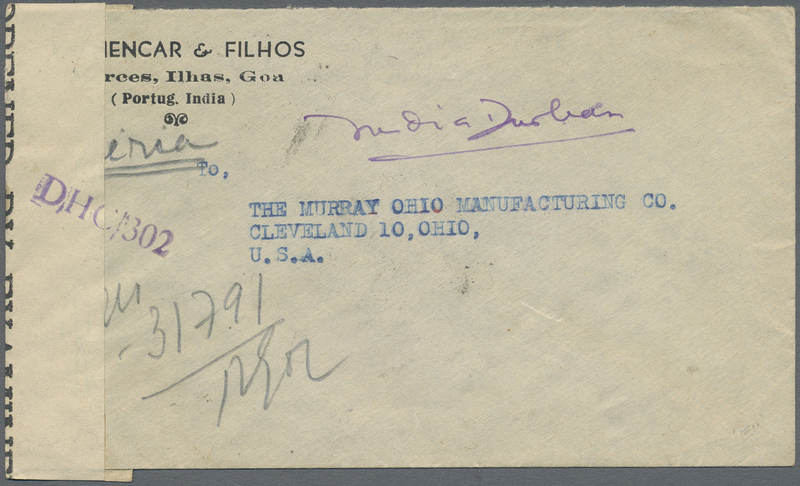 with 'NOVA-GOA' reg. 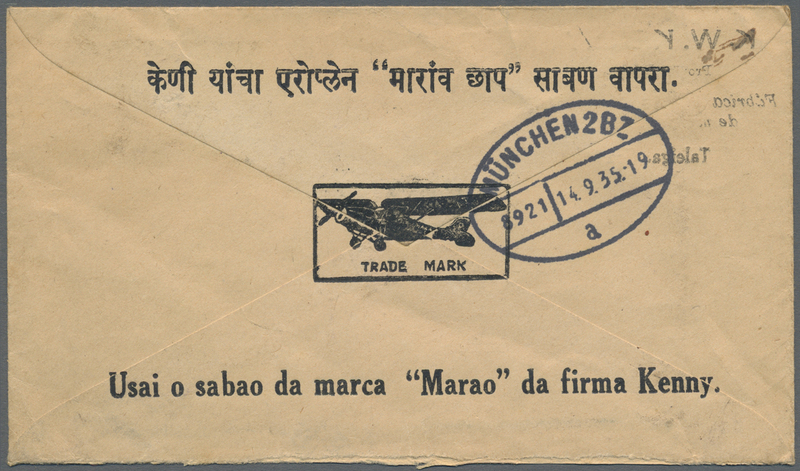 label in black on yellow, and 2) 1937 cover bearing 1933 2t. 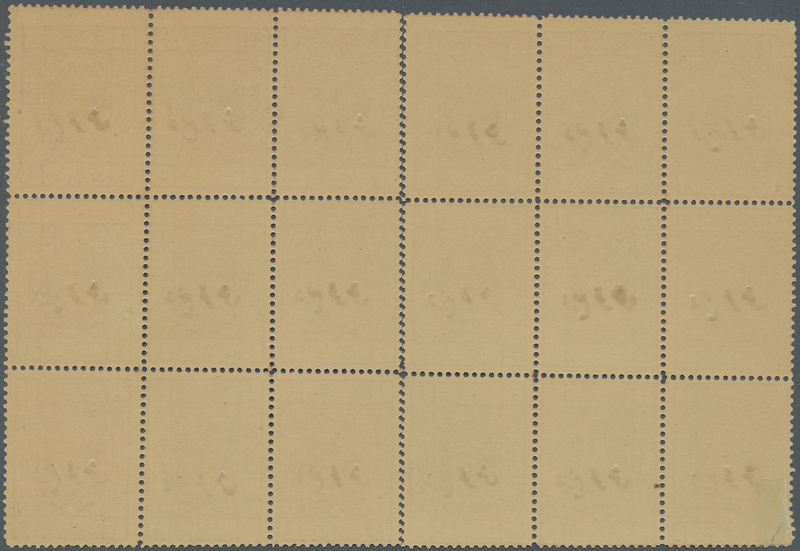 and 2½t. 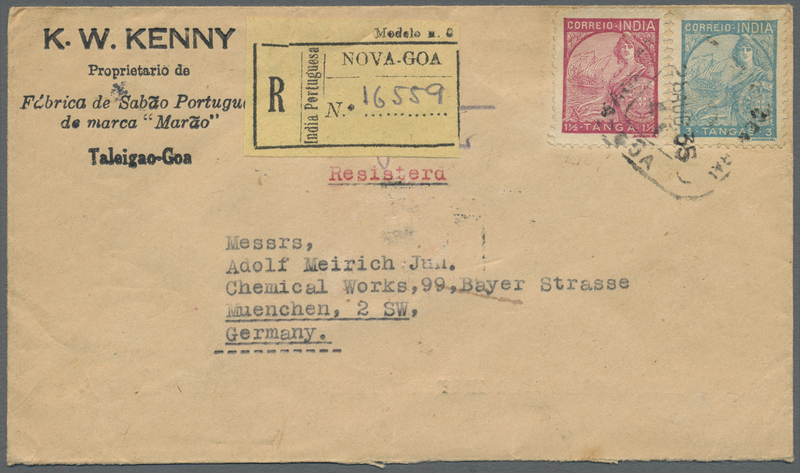 and 'Nova Goa' reg. 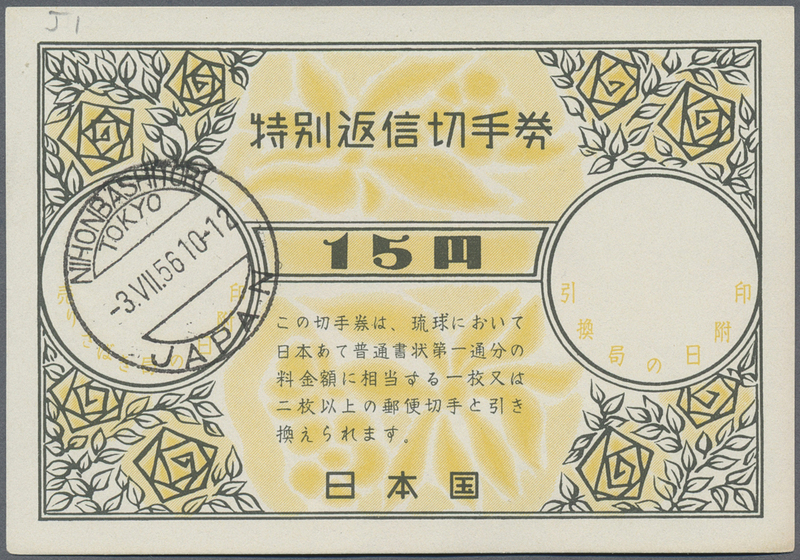 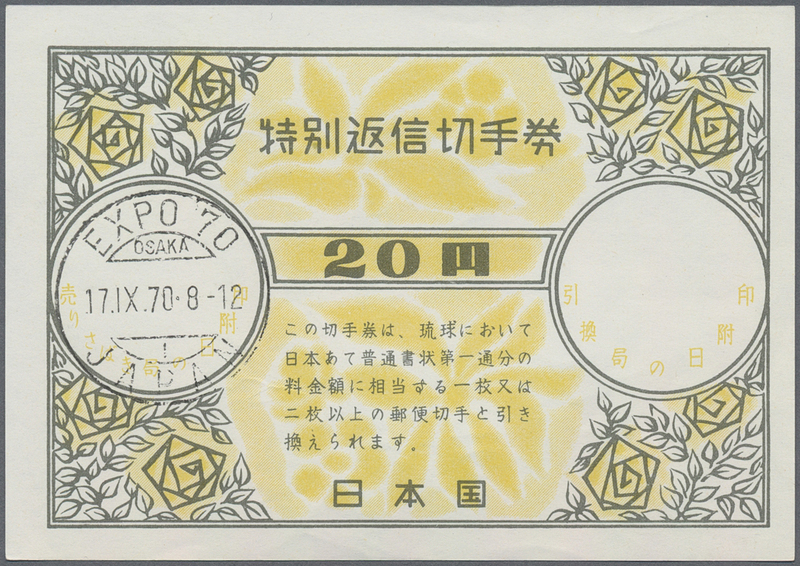 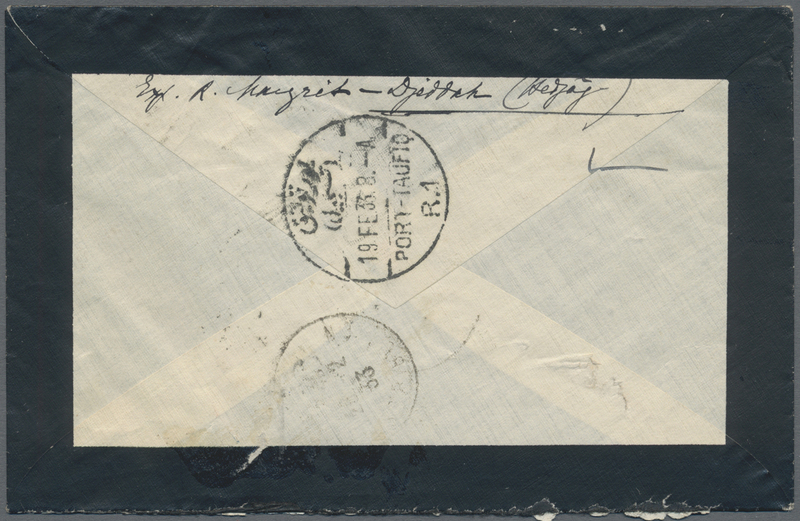 label in black on yellow-buff, both with Munich railway arrival datestamp on back. 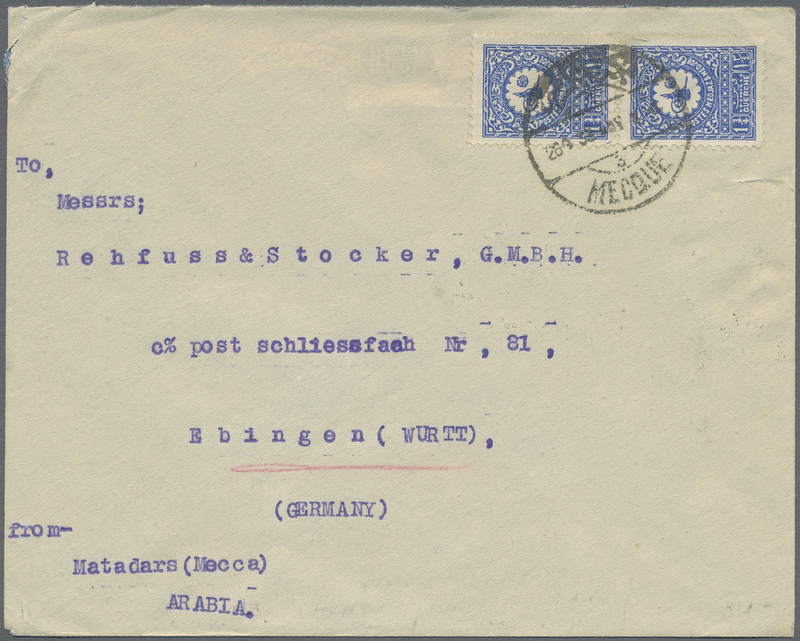 9573 postfrisch (never hinged) ** 226 Pr. 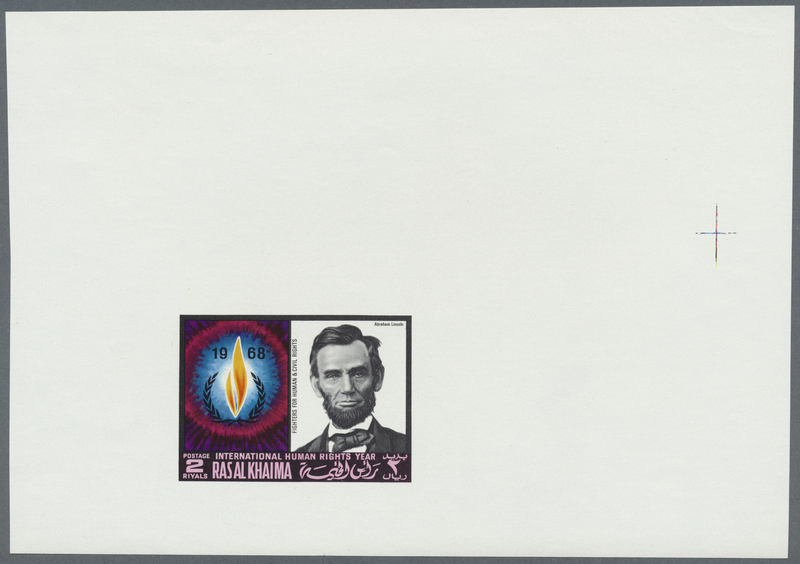 1968, Abraham Lincoln / International Human Rights Year 2 Ryls, final proof in s/s style, mint never hinged MNH. 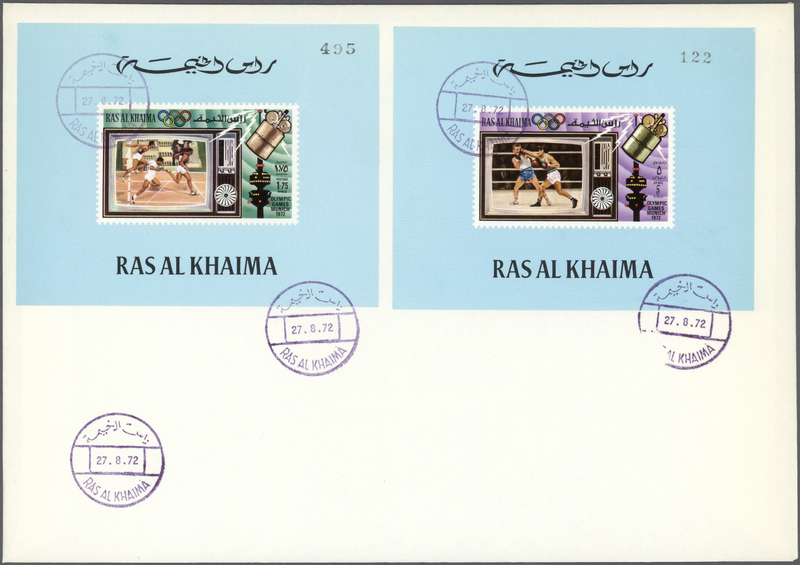 9574 Brief (cover) 824/30 1972, TV Broadcasting of Olympic Games, DE LUXE SHEETS with coloured margin, country name and number, complete set of seven values on four unaddressed envelopes, neatly oblit. 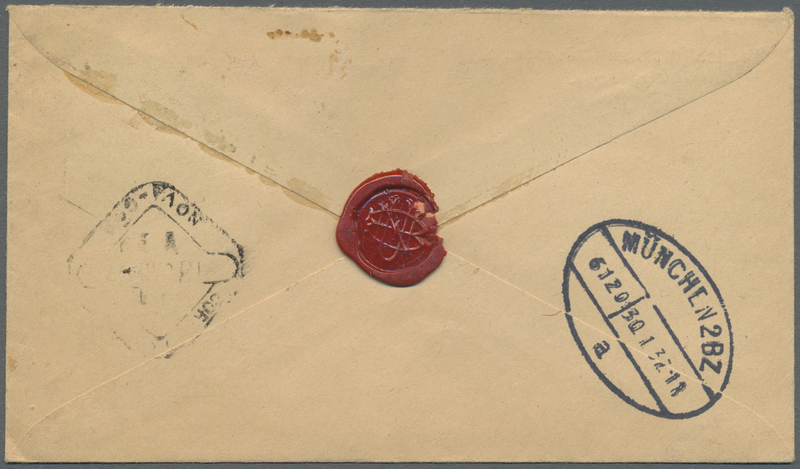 by violet c.d.s. 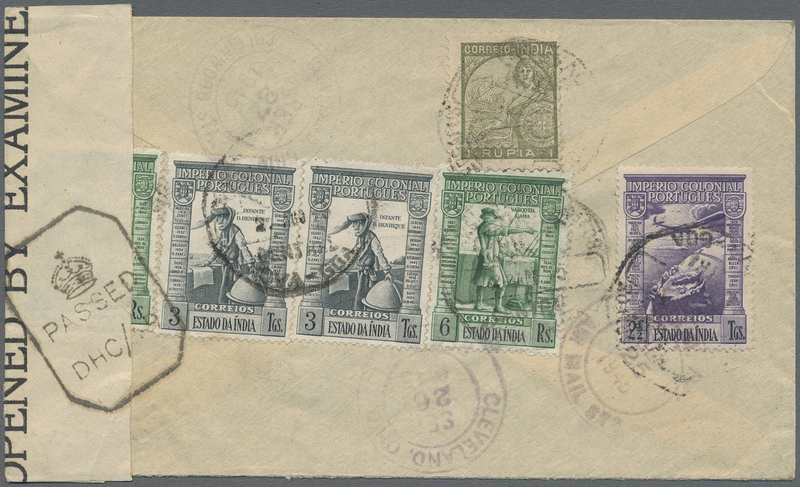 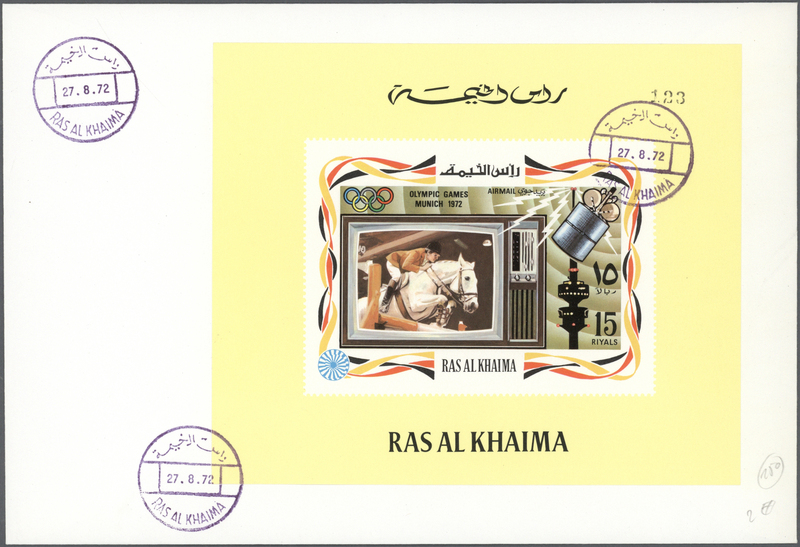 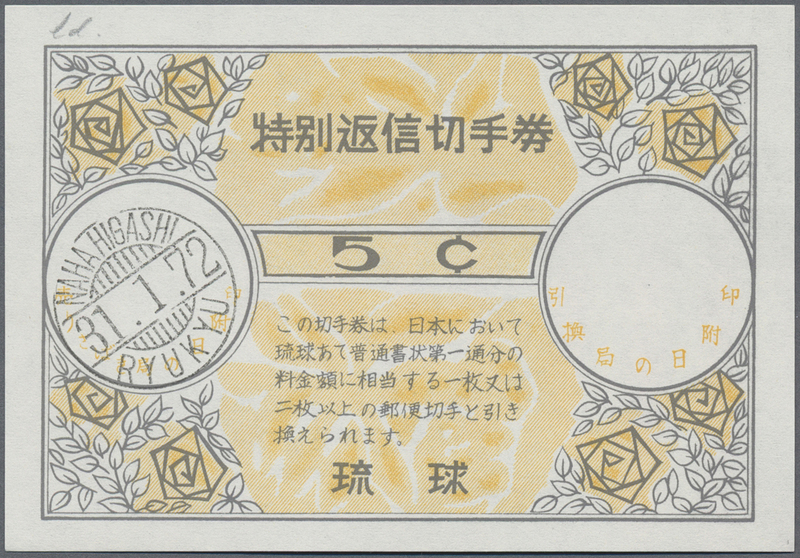 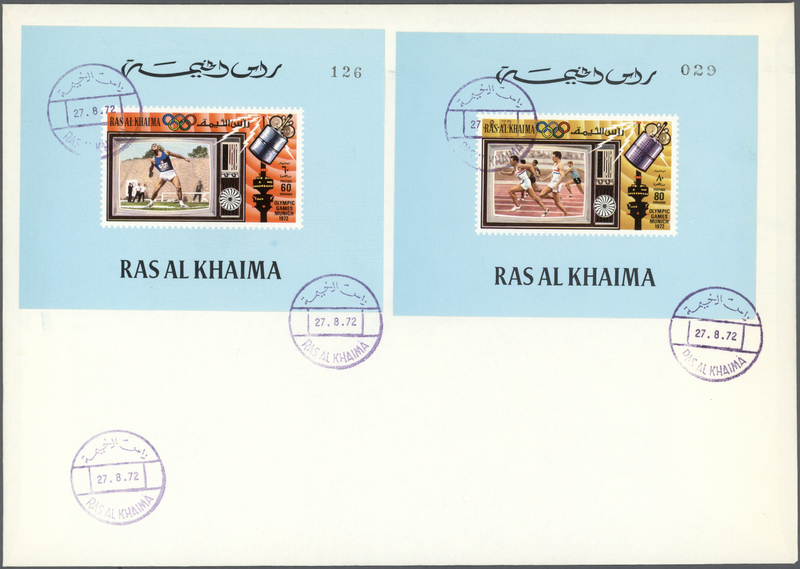 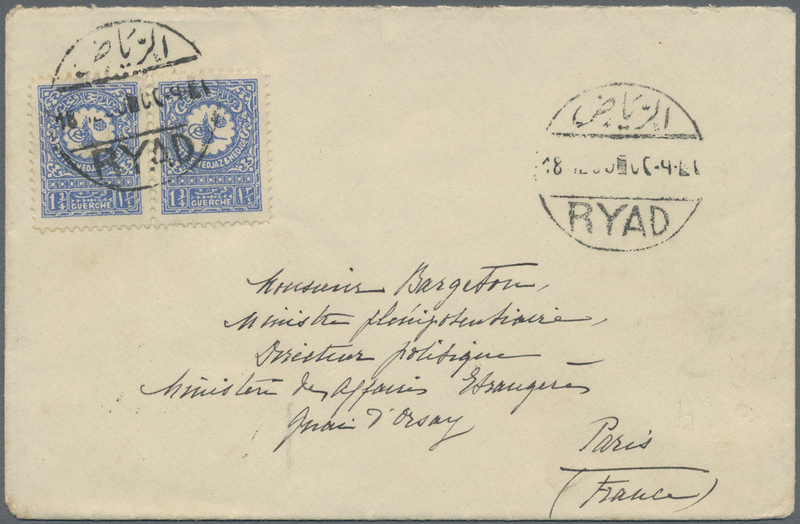 "RAS AL KHAIMA 27.8.72"
9575 Ganzsache (Complete) 1956/72, IRC international reply coupons: "special reply coupons" for Ryukyus-Japan traffic, 4 C., 5 C., 6 C. resp. 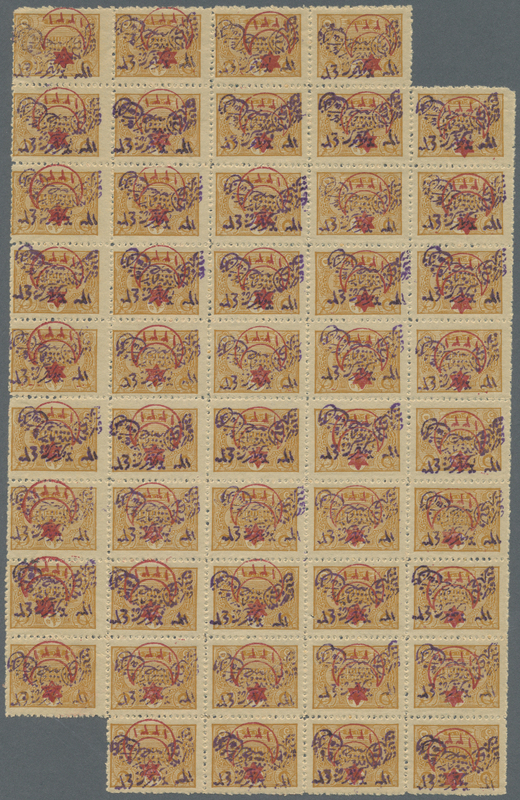 Japan-Ryukyus 15 Y., 20 Y. 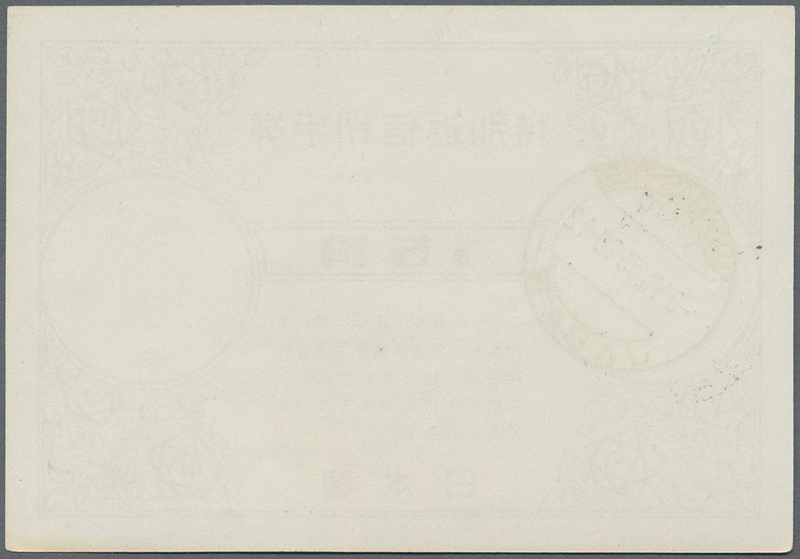 Total 5 items. 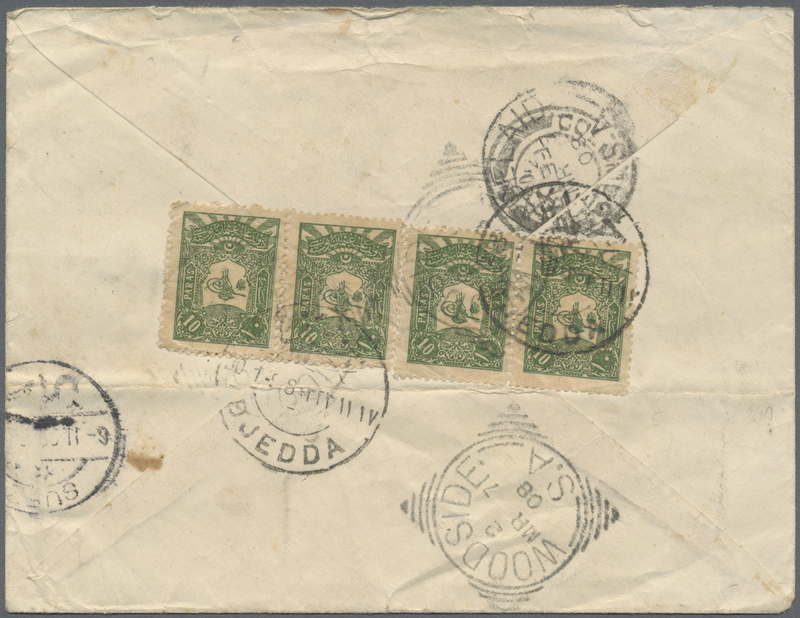 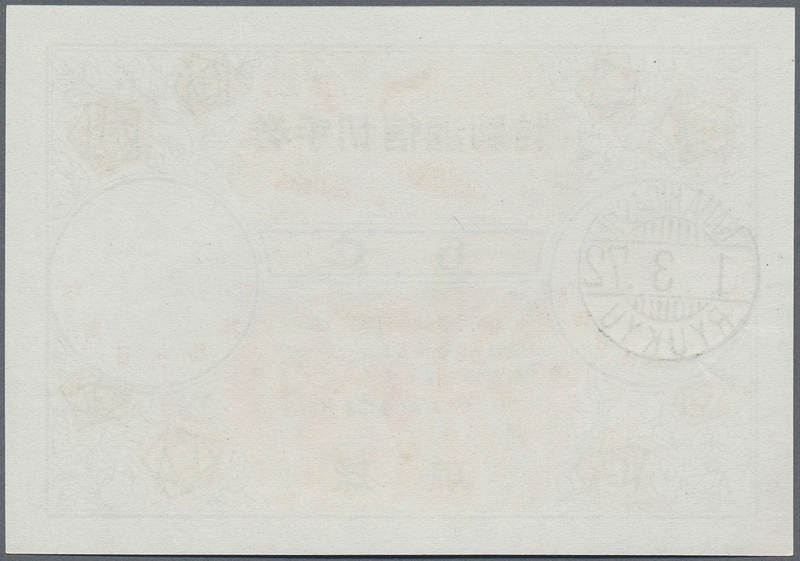 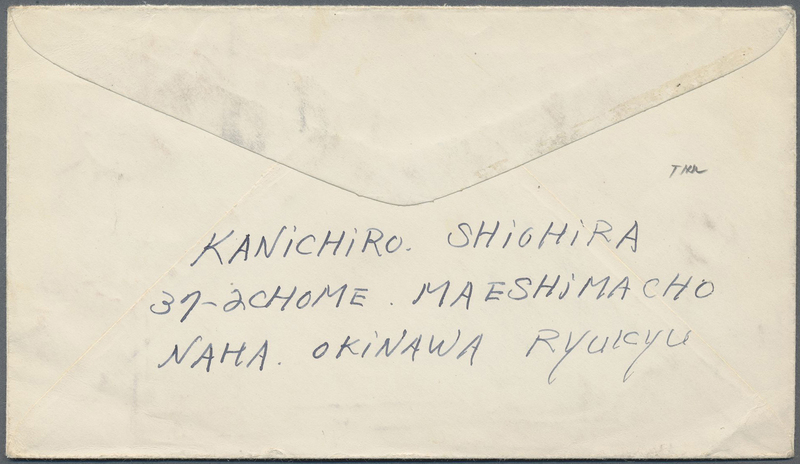 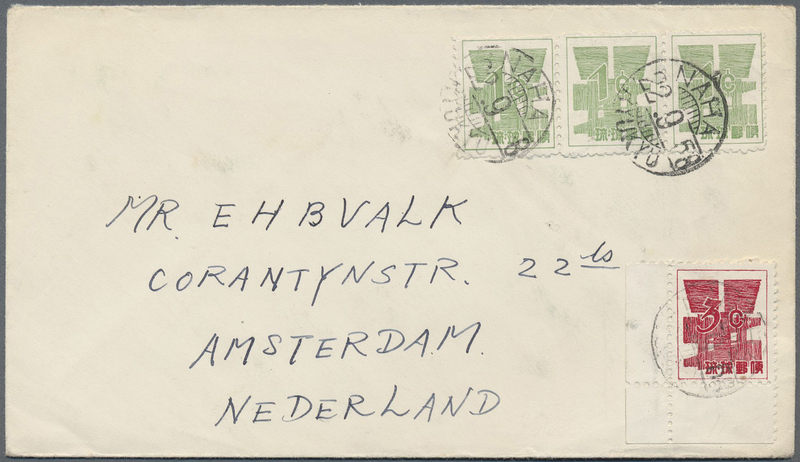 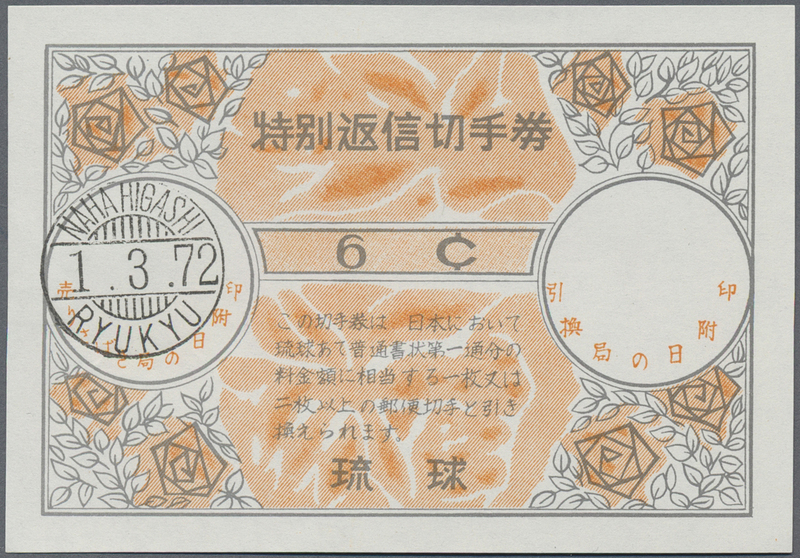 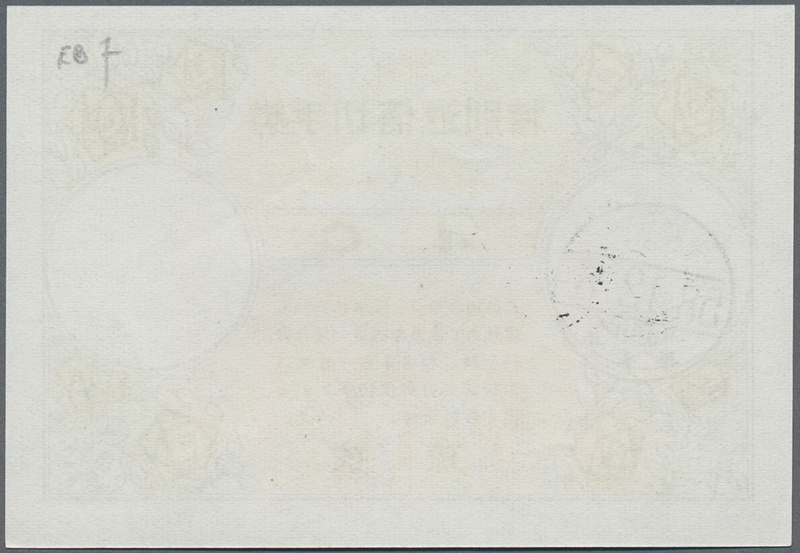 9576 Brief (cover) 59 (3), 61 1958, 1 C Yen symbol in strip of 3 together with 3 C. margin piece lower right corner on letter from NAHA to Amsterdam. 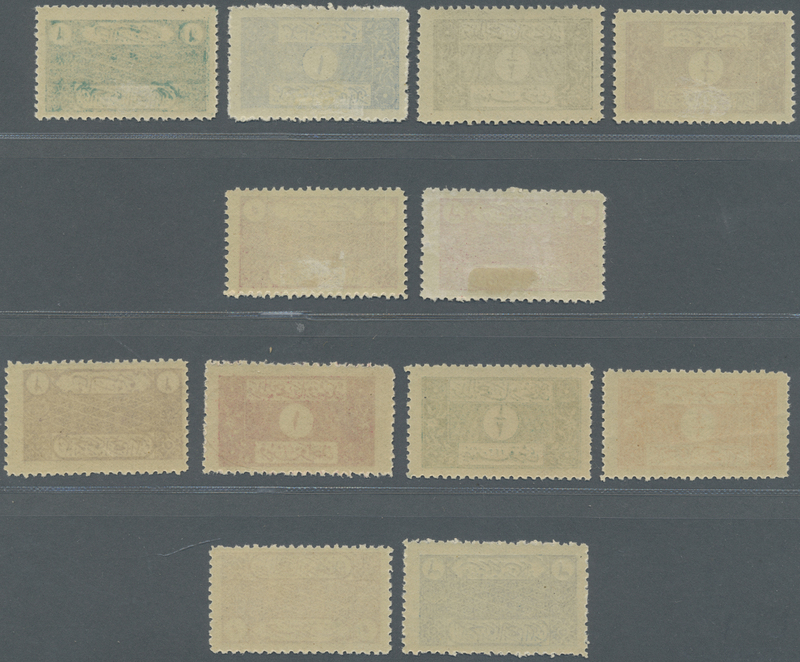 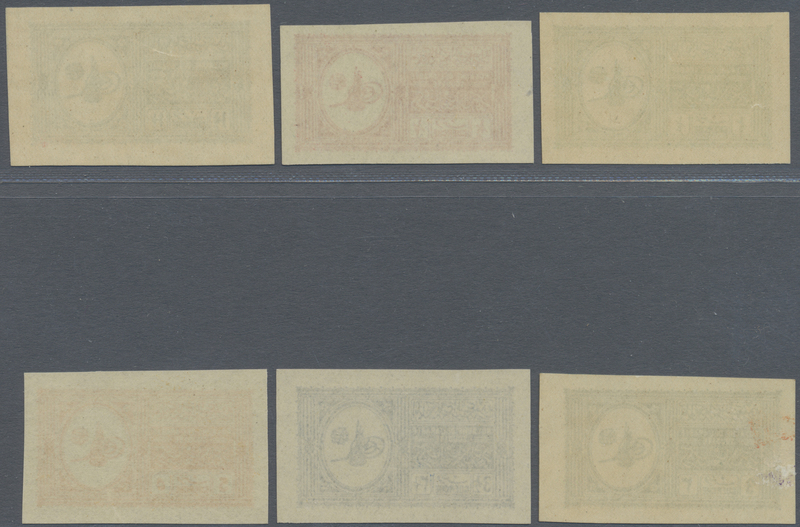 9577 postfrisch (never hinged) ** ungebraucht ohne Gummi (unused without gum) (*) 1C, 2, 3C 1916, 1/2 Pia-1 Pia set perforated 12, the 1/2 Pia green NG, otherwise mint never hinged MNH. 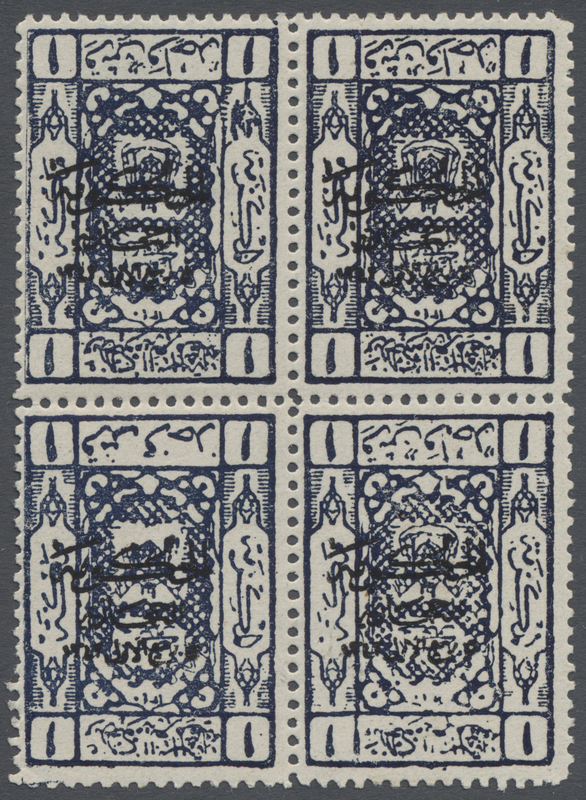 The 1 Pia. 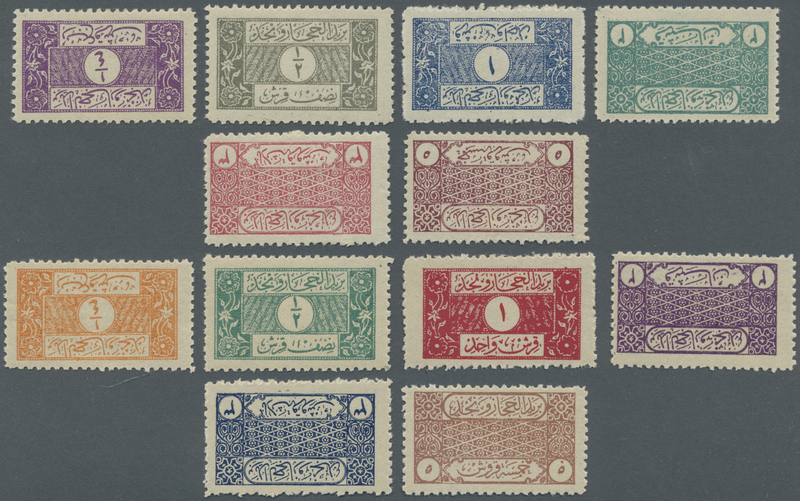 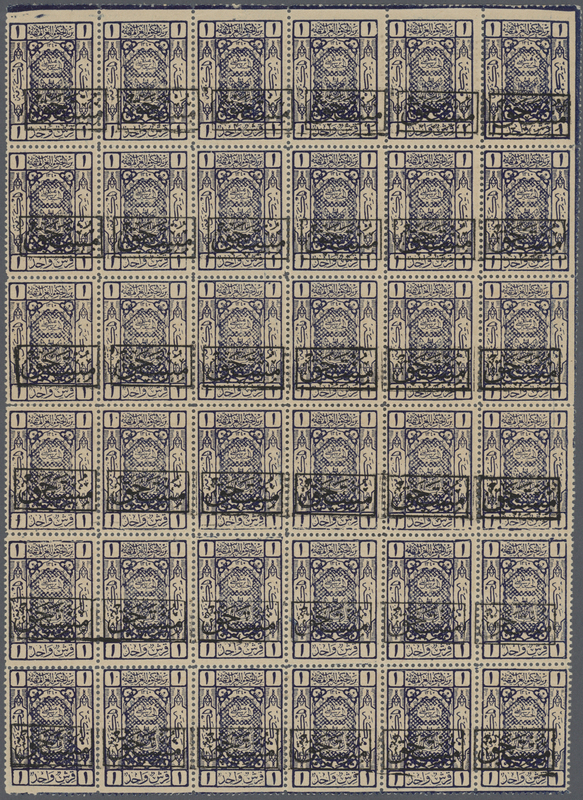 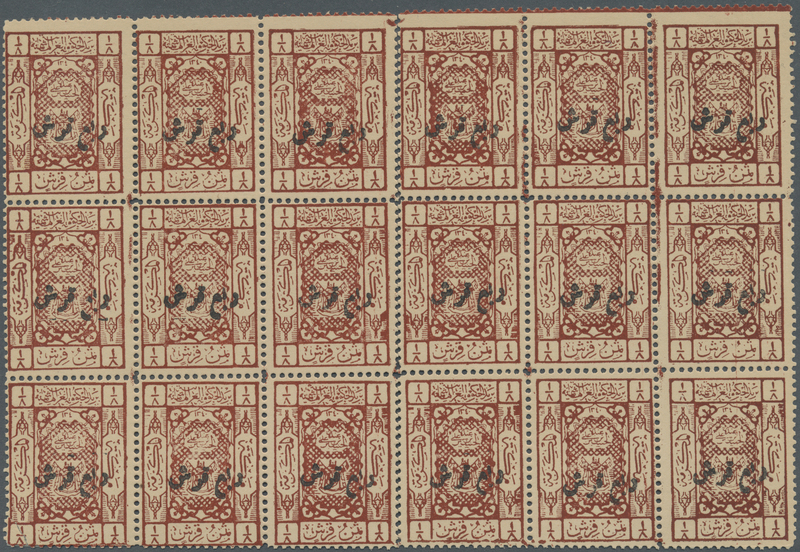 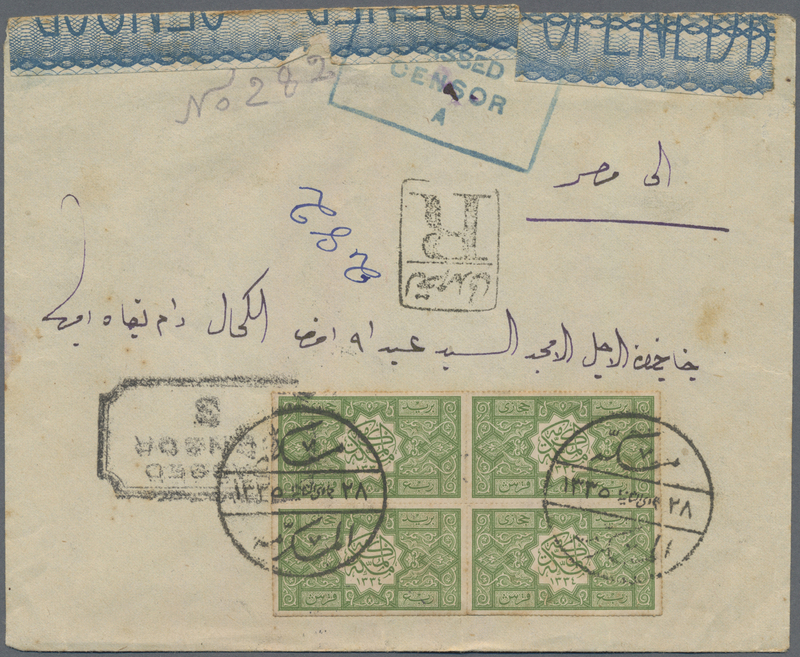 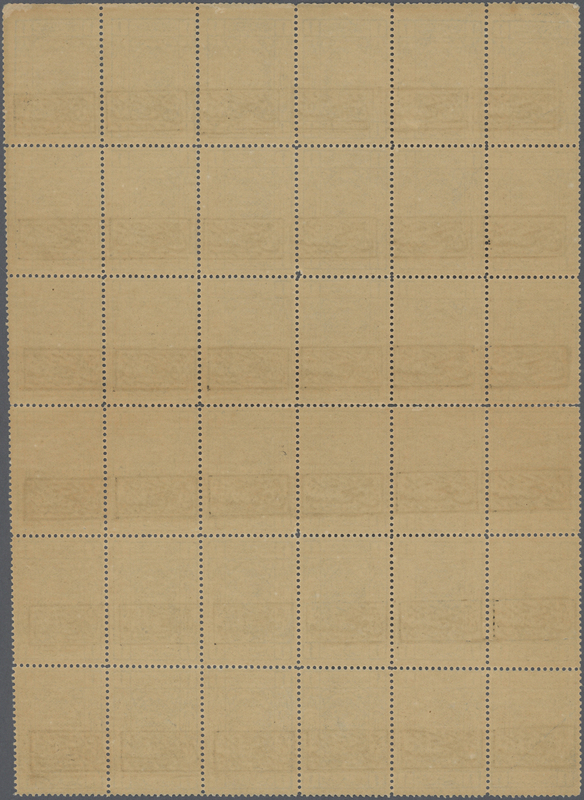 blue is the first stamp printed for the Hejaz, only 56 sheets were printed in this perf. 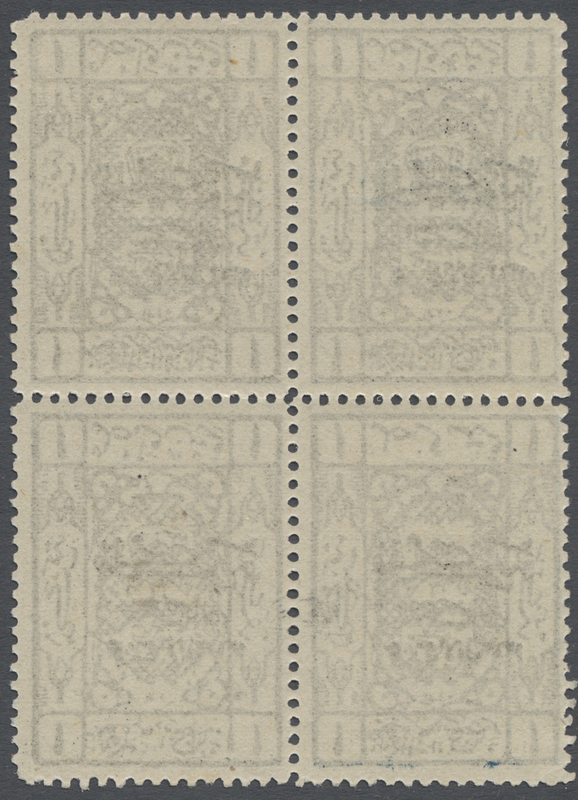 The extant copy is the finest centered one we have seen, a showpiece (Scott L1a, 2, 3a). 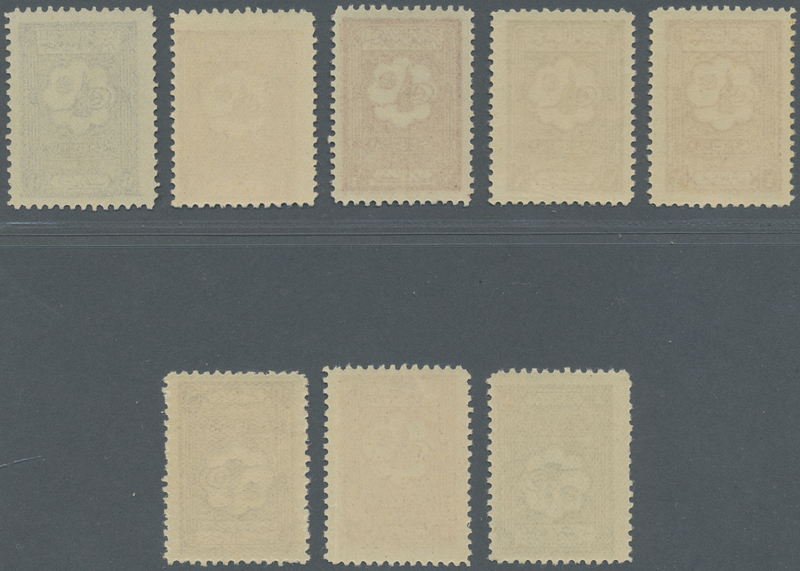 9587 ungebraucht (hinged) * 15/19 1925, pilgrimage commemoration set, unused mounted mint (SG 210/14, Scott 30/34). 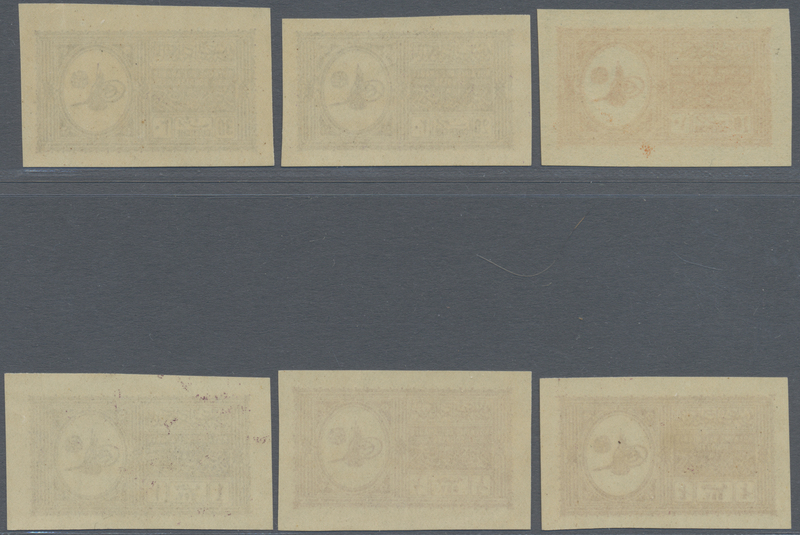 9588 ungebraucht (hinged) * Sc. 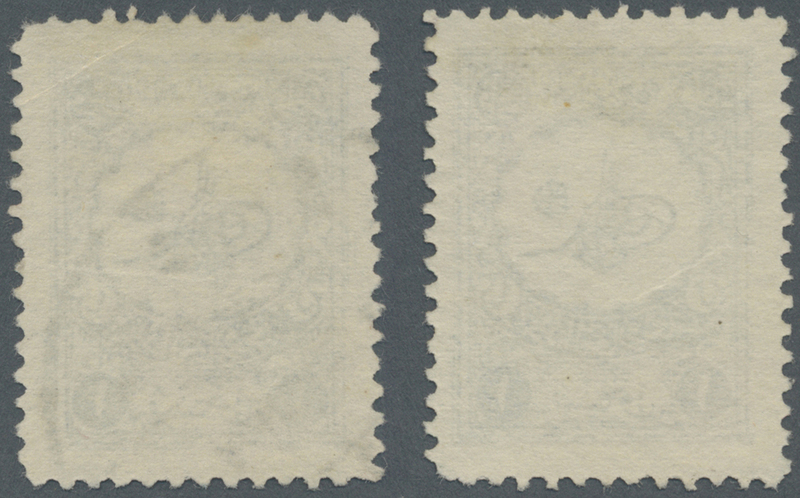 16 var. 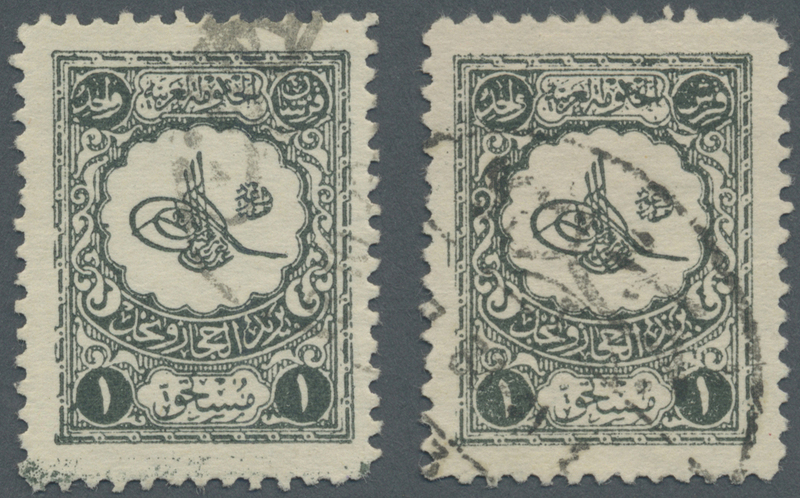 1925, 2 Pia. 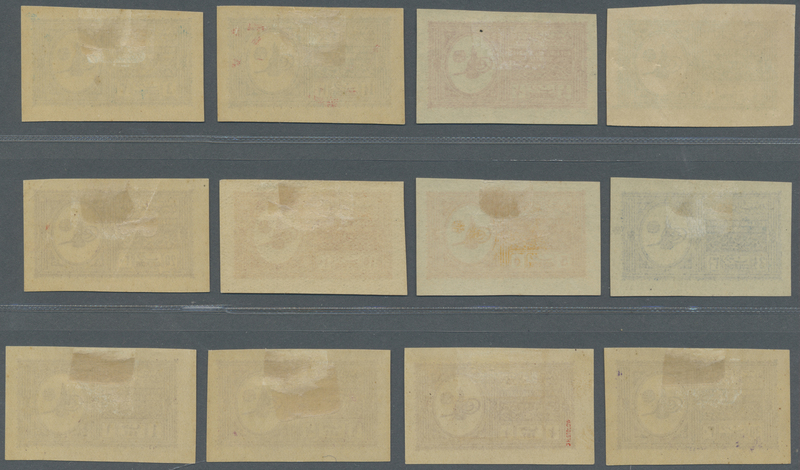 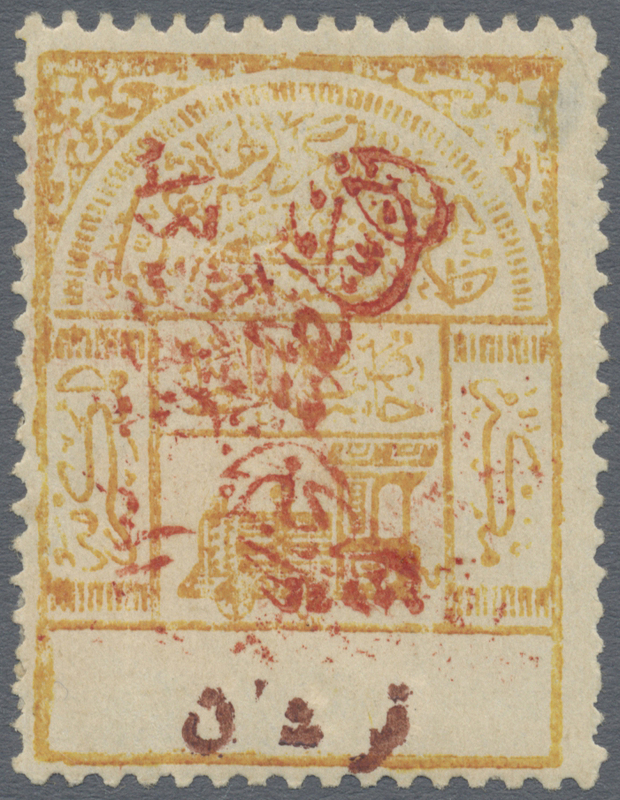 yellow buff overprinted in red sideways, mint hinged, fine and a rarity of early Saudi Arabia. 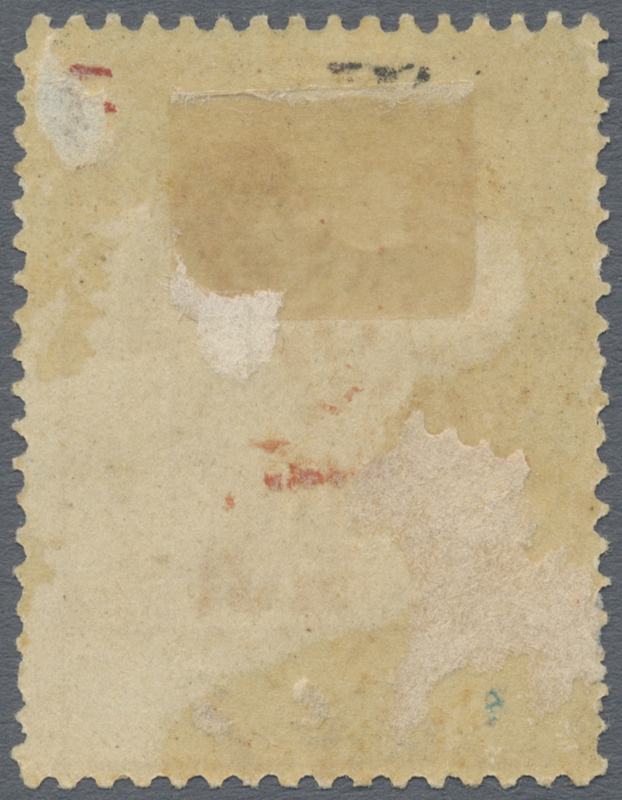 Lens-size thin site on the right top corner. 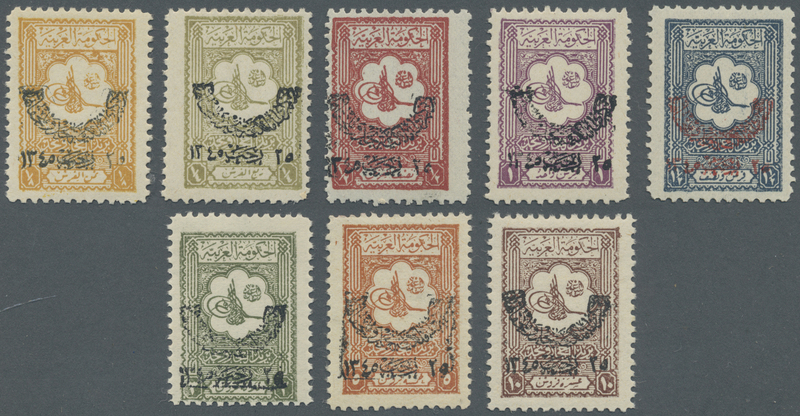 9590 ungebraucht (hinged) * 42/46 1925, capture of Medina set, unused mounted mint first mount VLH, 1 P./10 P. violet crease, signed A. Eid (SG 244/48, Scott 59/63). 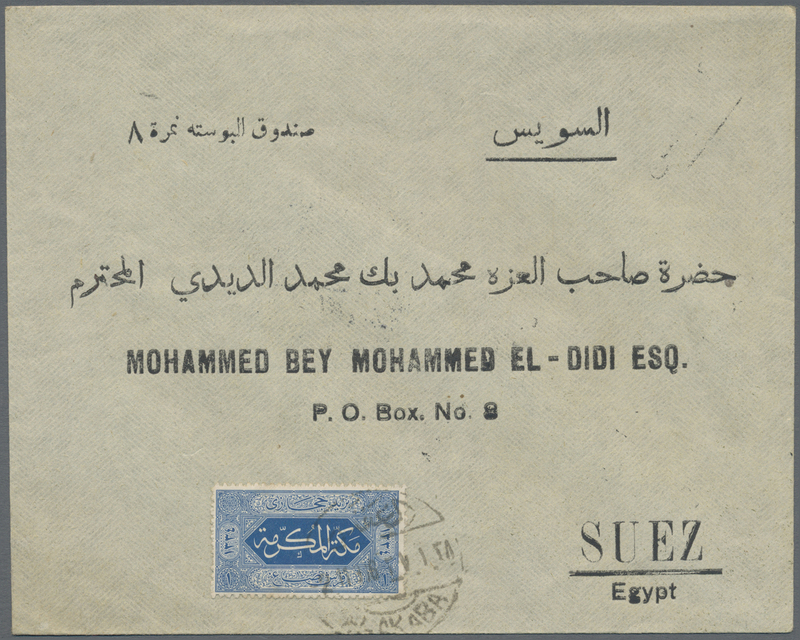 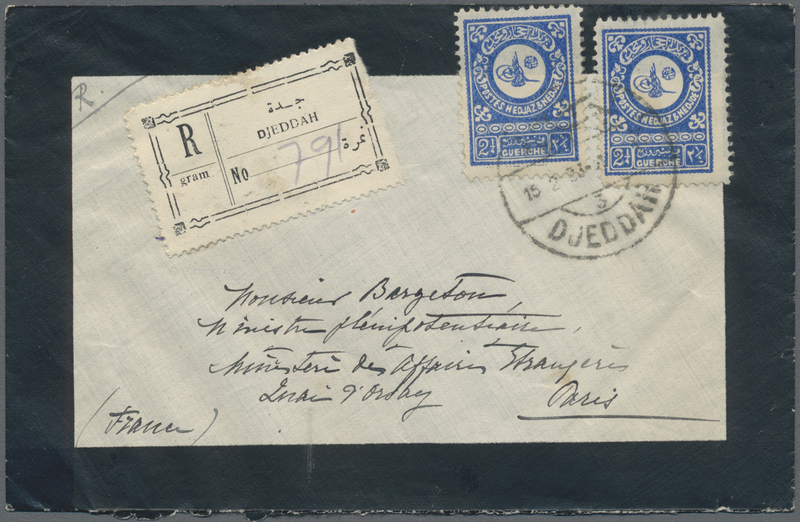 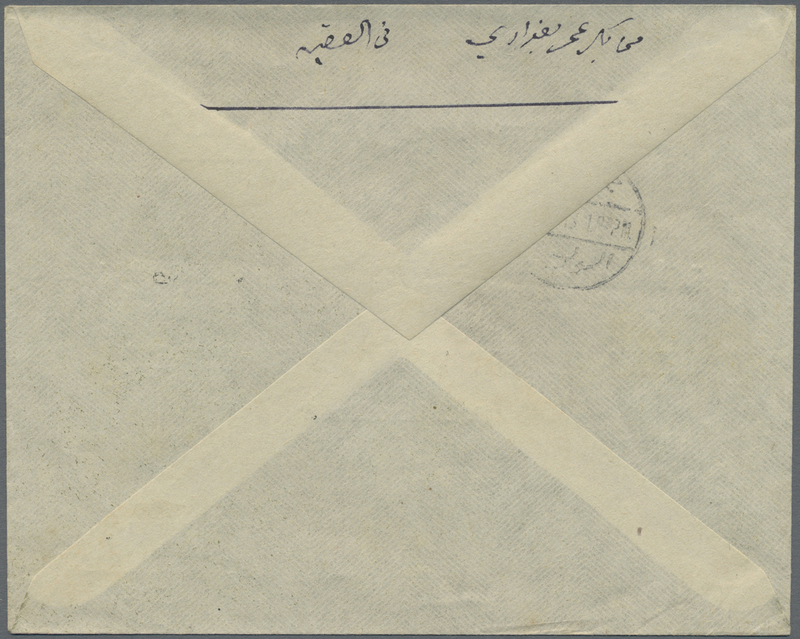 9591 ungebraucht (hinged) * 47/51 1925, capture of Djeddah set, unused mounted mint first mount VLH, signed A. Eid (SG 249/53, Scott 64/68). 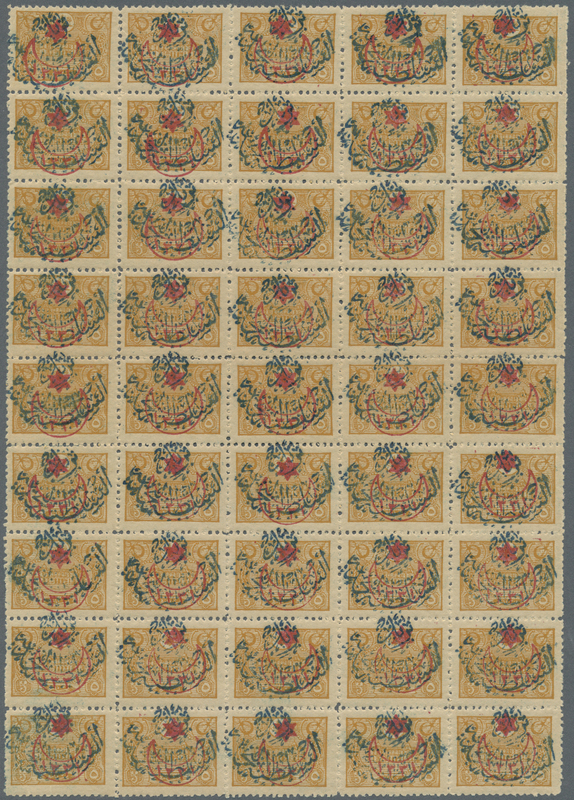 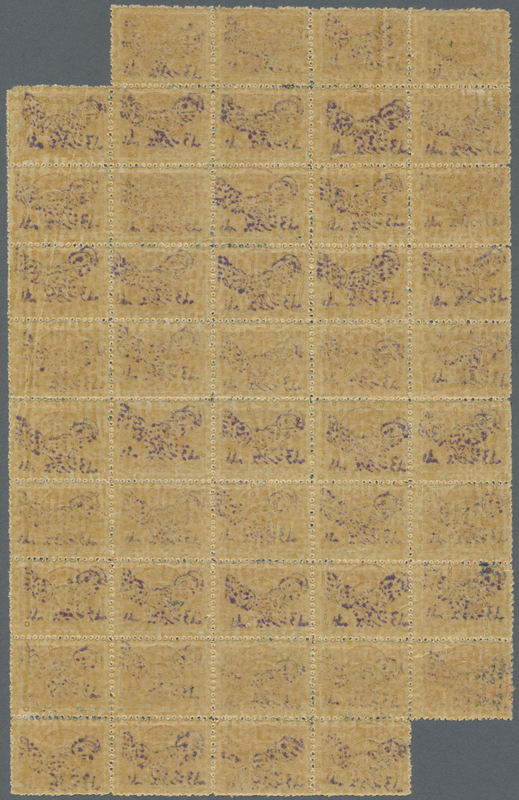 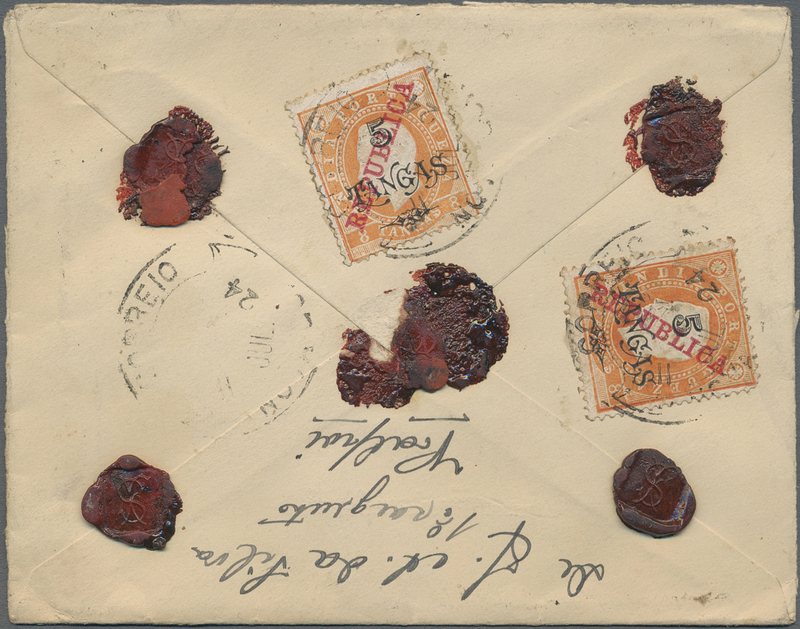 9592 ungebraucht (hinged) * 52/57, 58/63 1925, ornaments sets, unused mounted mint first mount LH (SG 254/66, Scott 69/80). 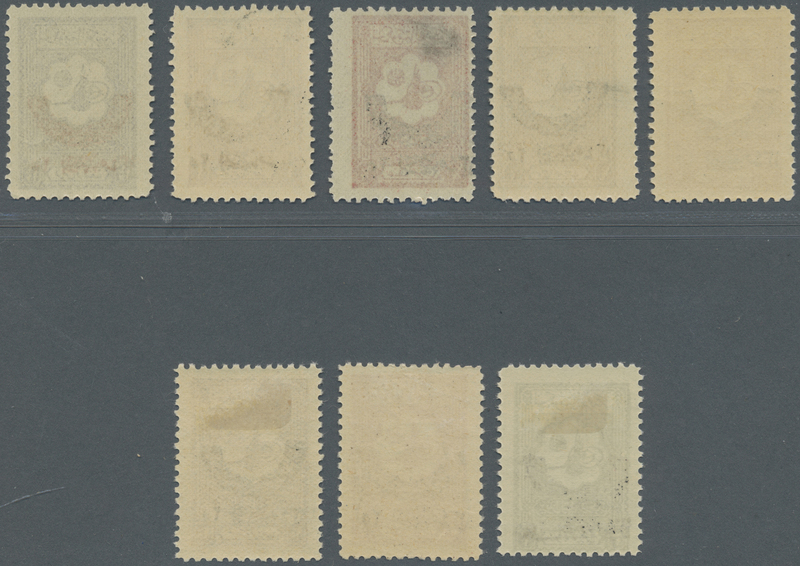 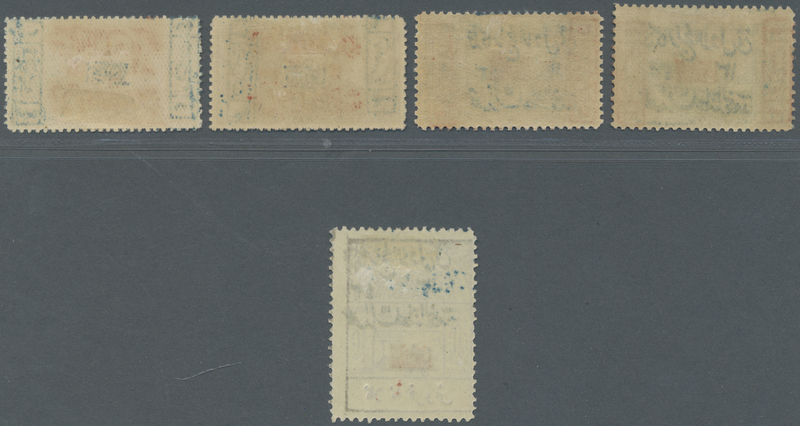 9593 postfrisch (never hinged) ** 70/77, 78/85 1926/27, definitives set 1/2 Pia-10 Pia, mint never hinged MNH. 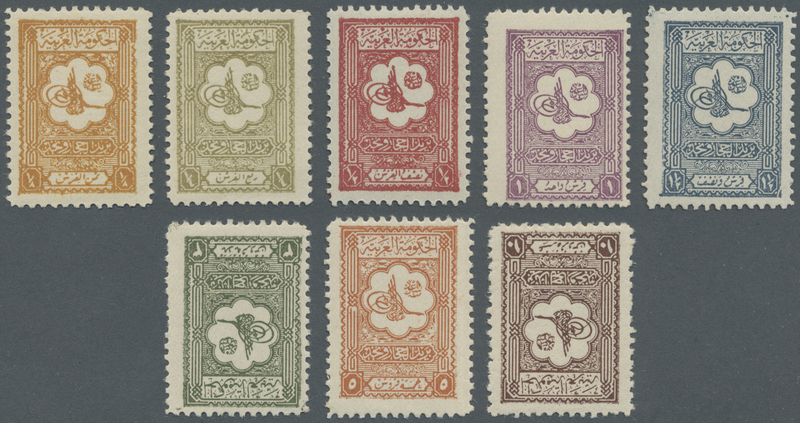 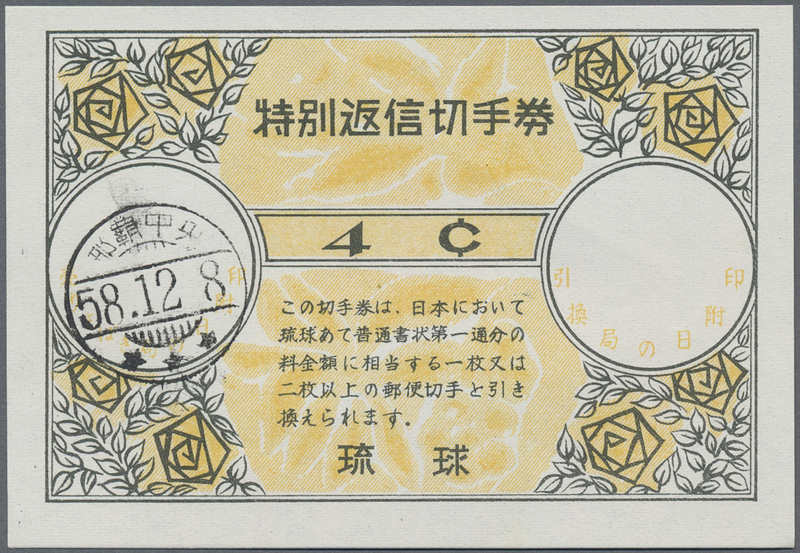 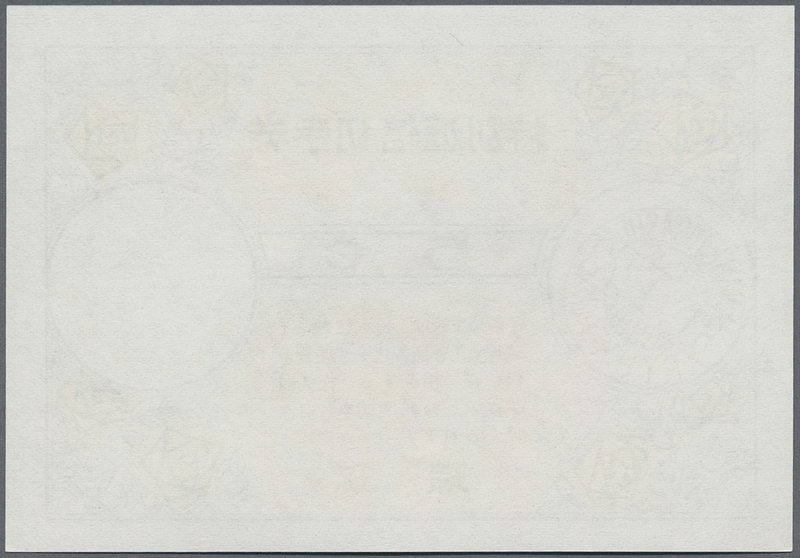 Establishment of kingdom set, mounted mint or MNH (SG 284/91 + 294/301, Scott 98/105, 107/114). 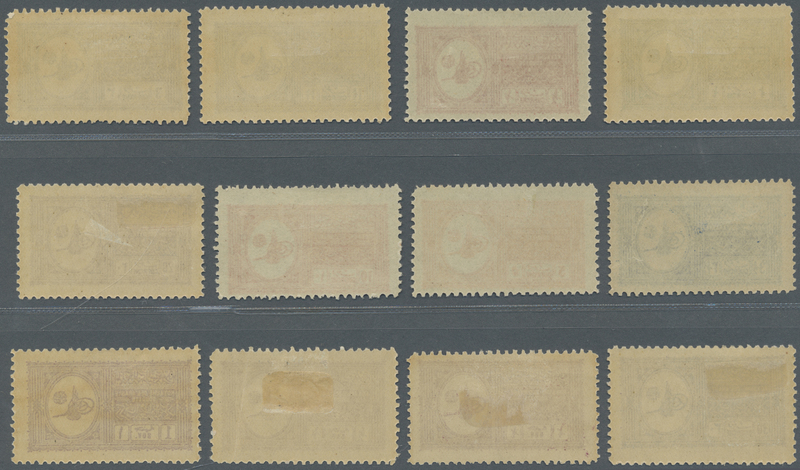 9594 ungebraucht (hinged) * 66/68 1929, set with additional latin letter inscription, unused mounted mint (SG 302/04, Scott 117/120). 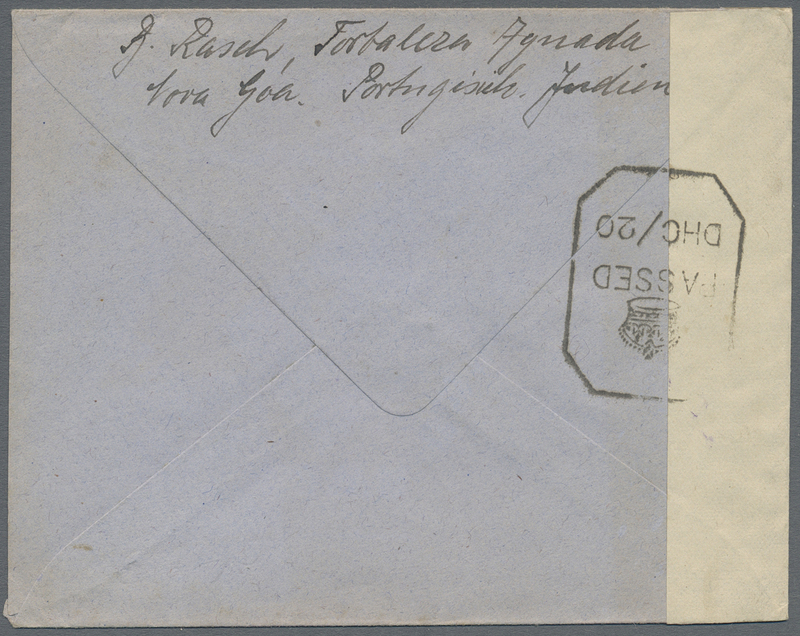 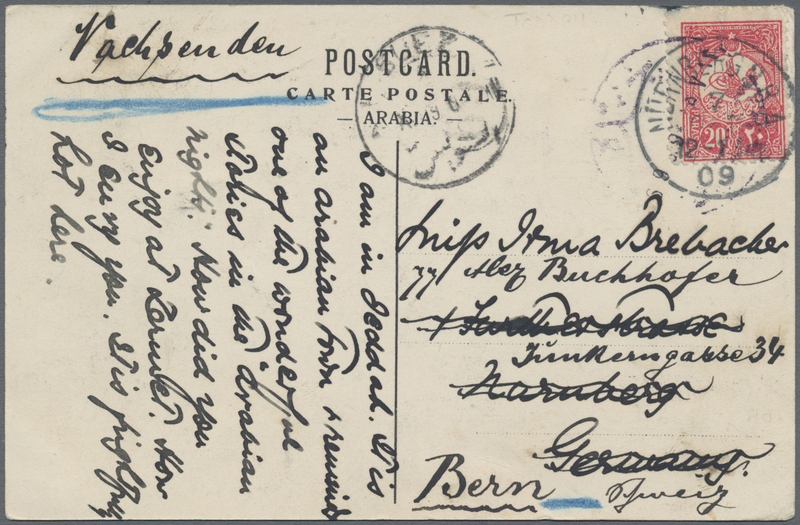 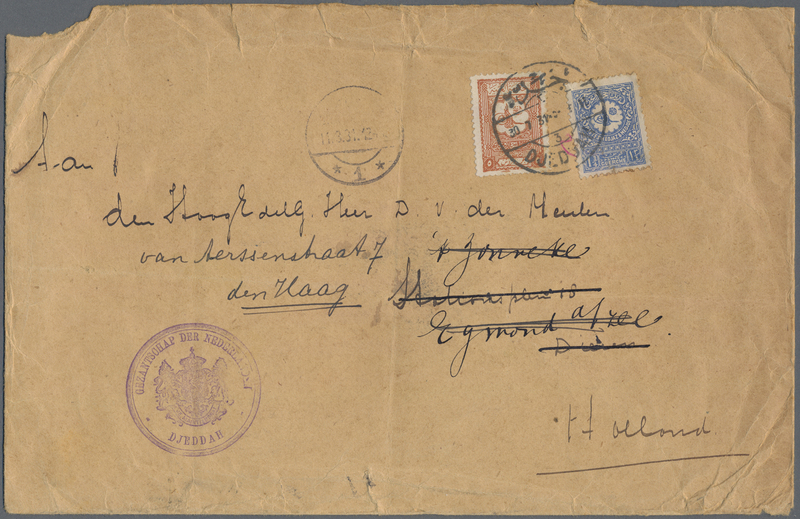 9598 Ganzsache (Complete) P/S card of Dutch Ea 1917 Incoming mail to MECCA: Dutch East Indies postal stationery card 5c. 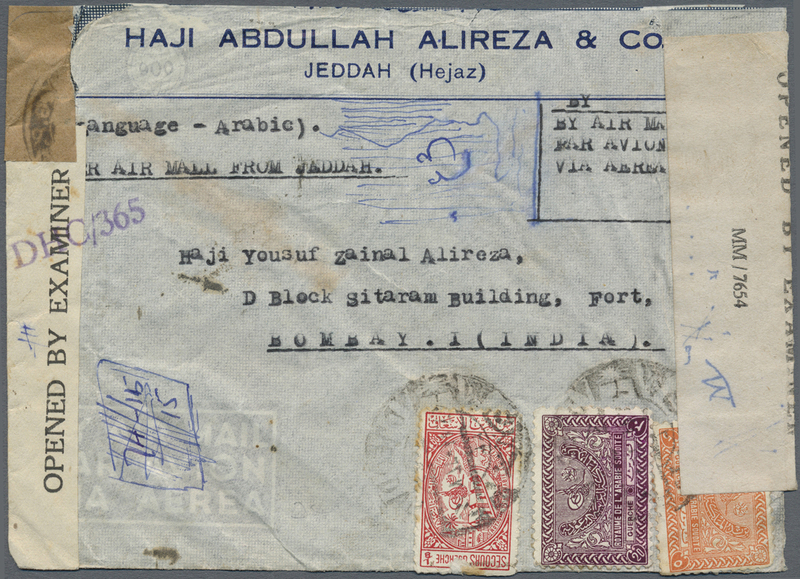 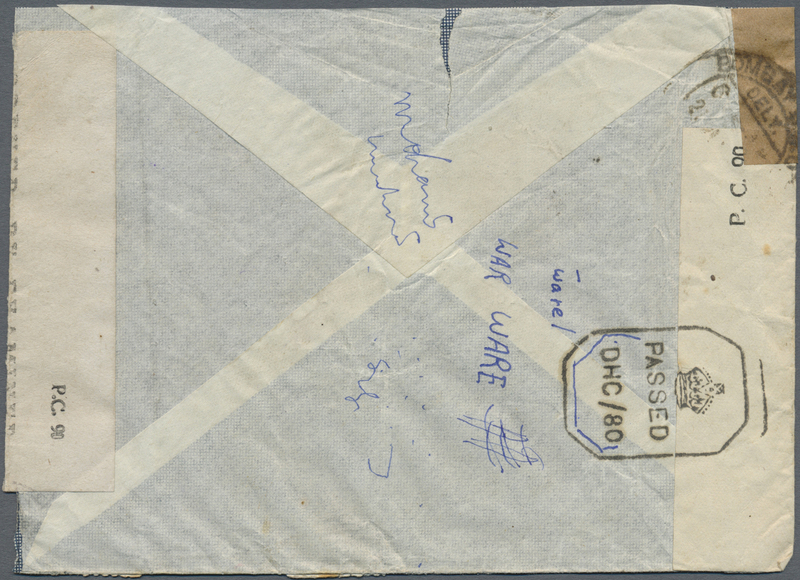 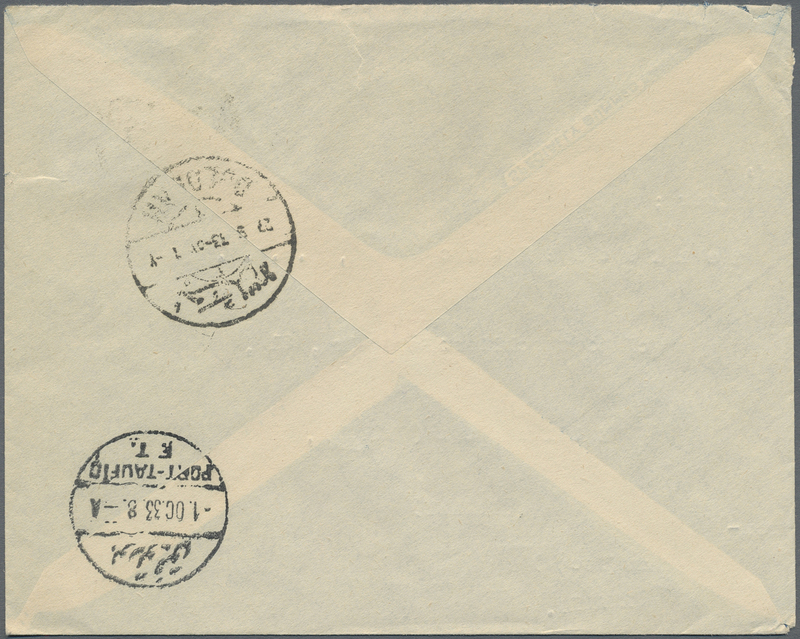 used from Palembang (24.4.17) to MECCA via Singapore and Jedda, with respective transit and arrival datestamps. 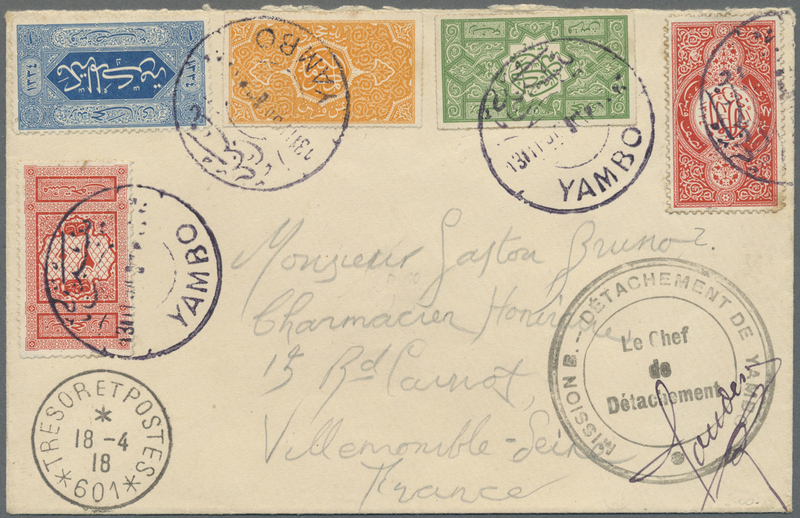 Postcard with light corner creases but still fine. 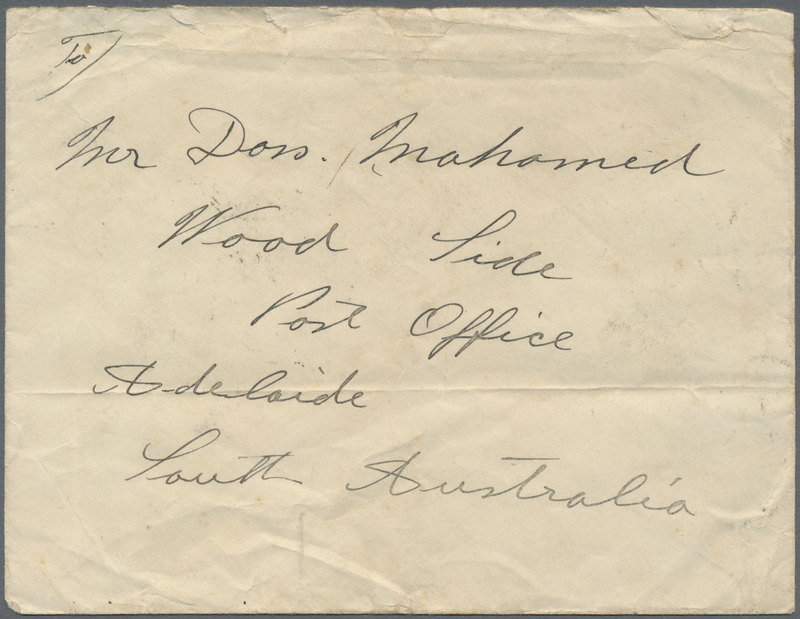 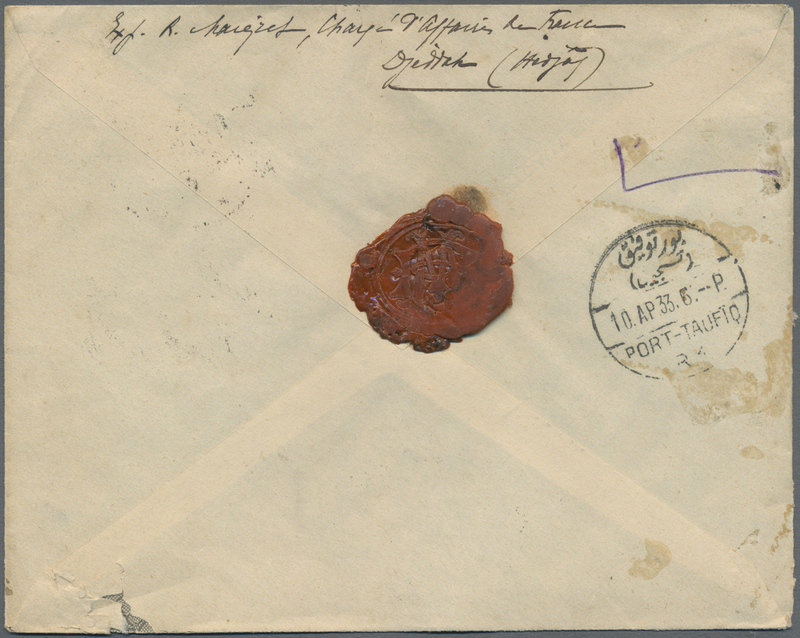 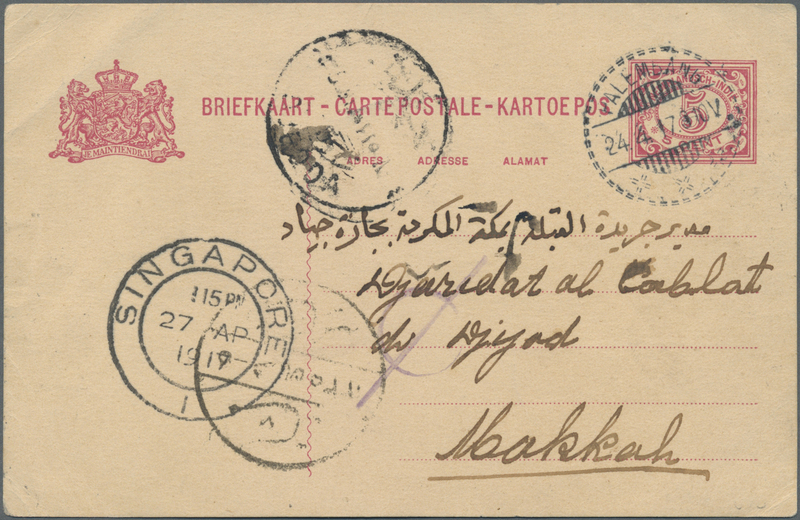 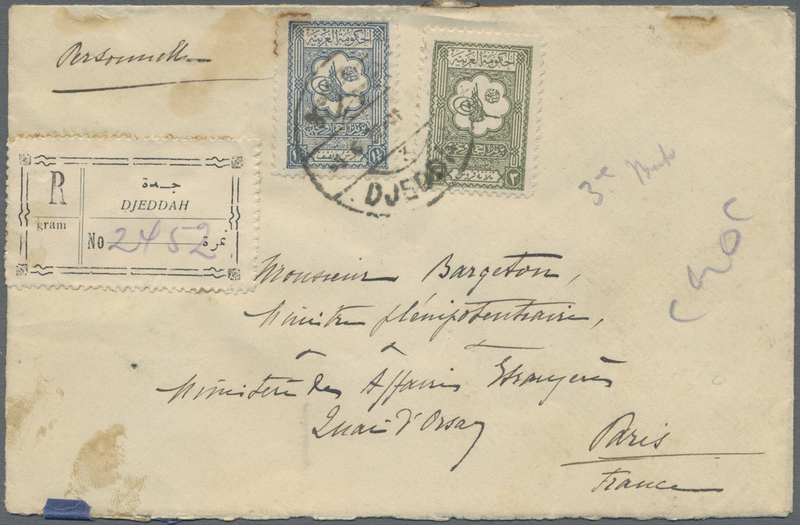 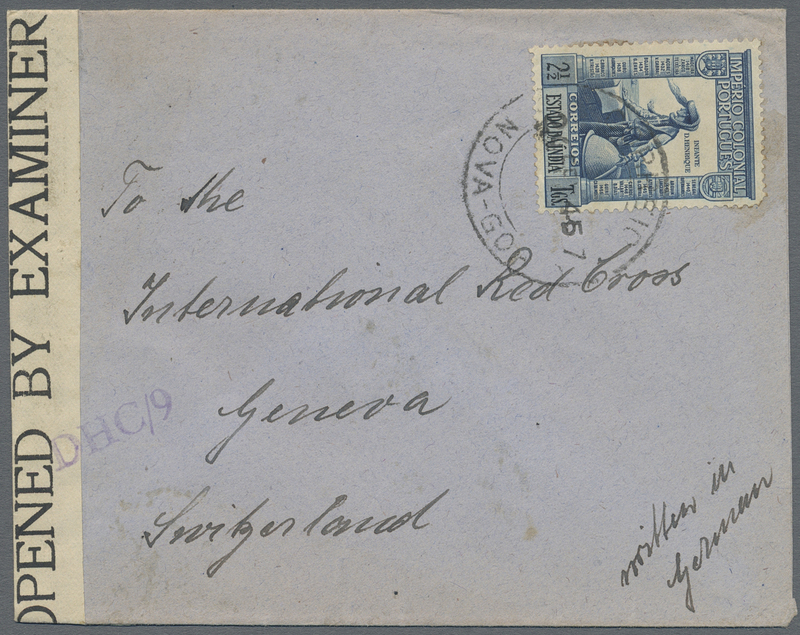 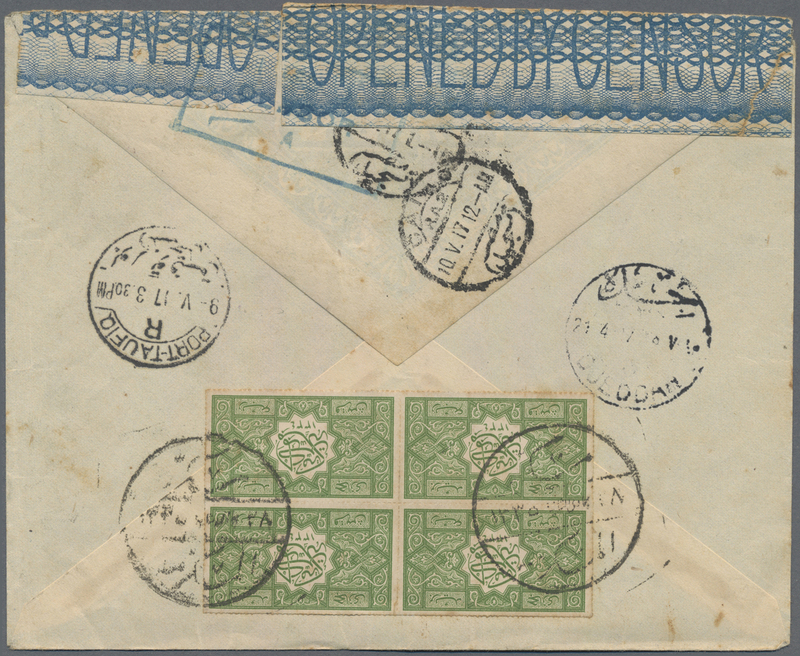 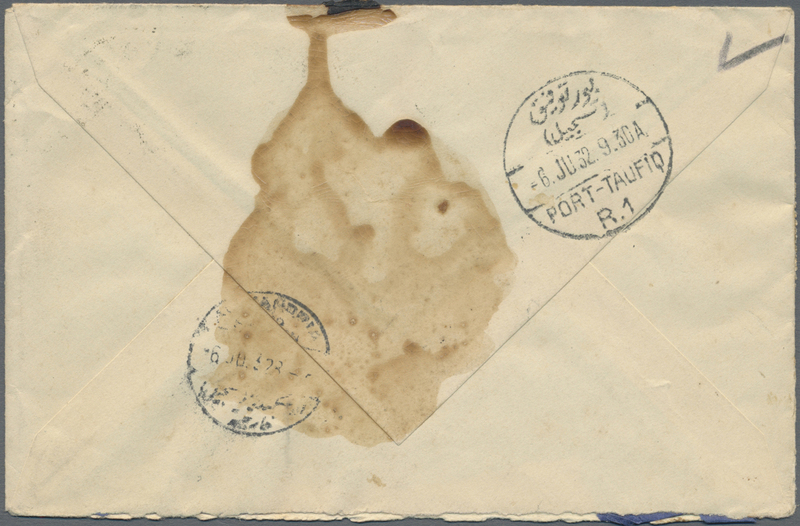 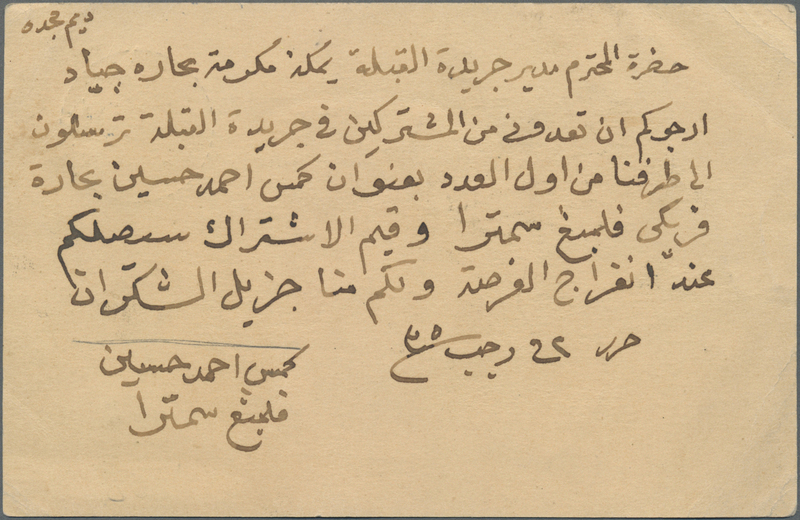 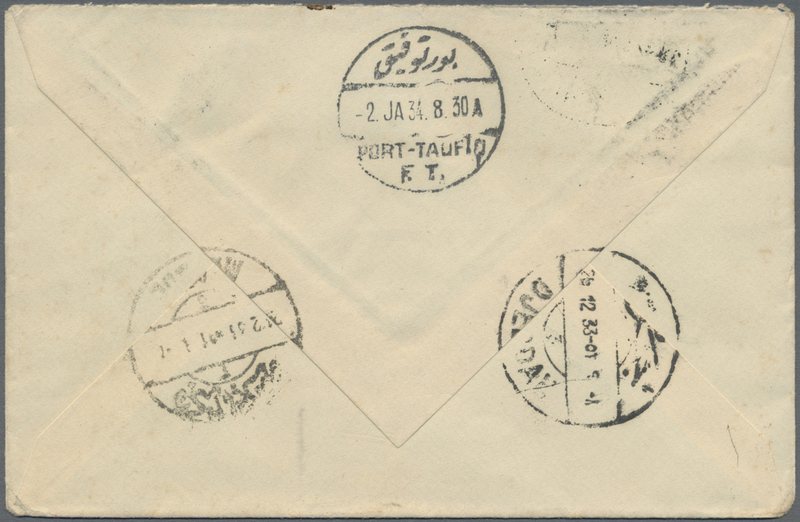 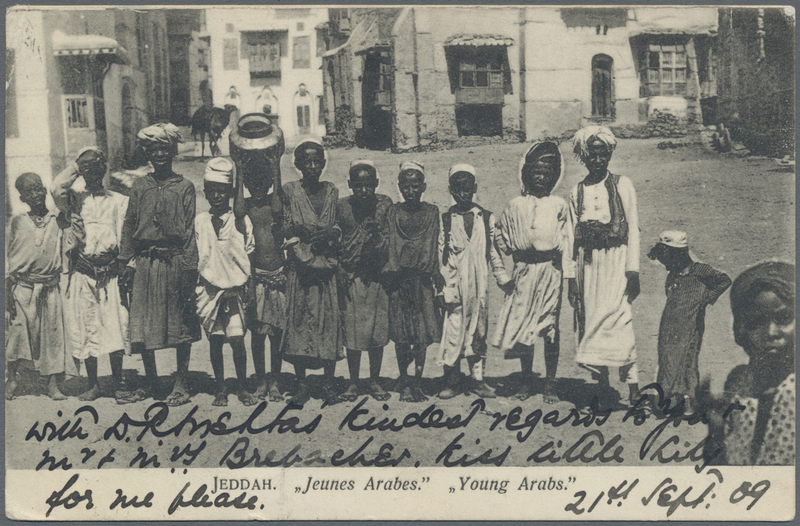 A VERY RARE MAIL DURING WWI FROM THE DUTCH EAST INDIES TO MECCA. 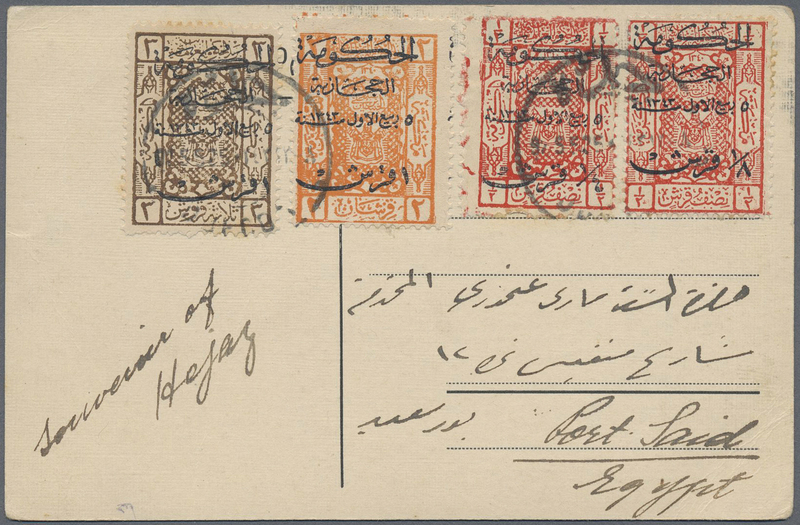 9603 ungebraucht (hinged) * 1/12 1934, proclamation of King Ibn Saud set, unused mounted mint first mount LH, 1/2 S. gum crease (SG 316/27, Scott 138/49). 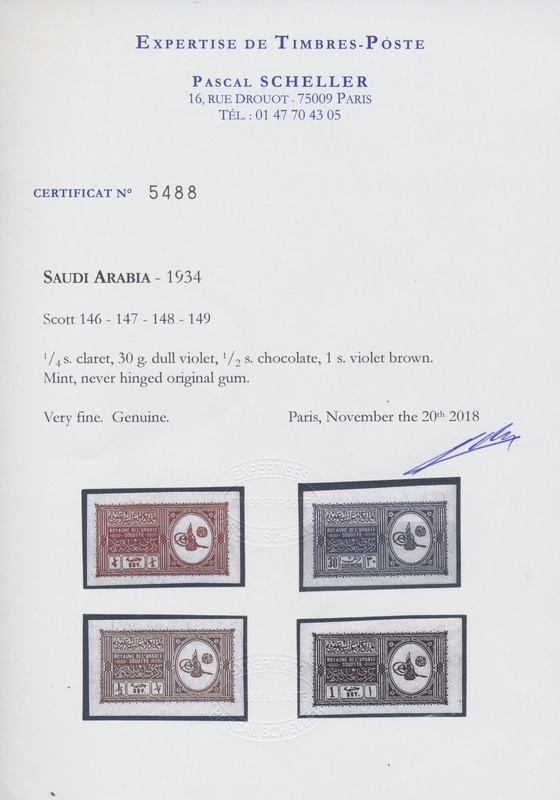 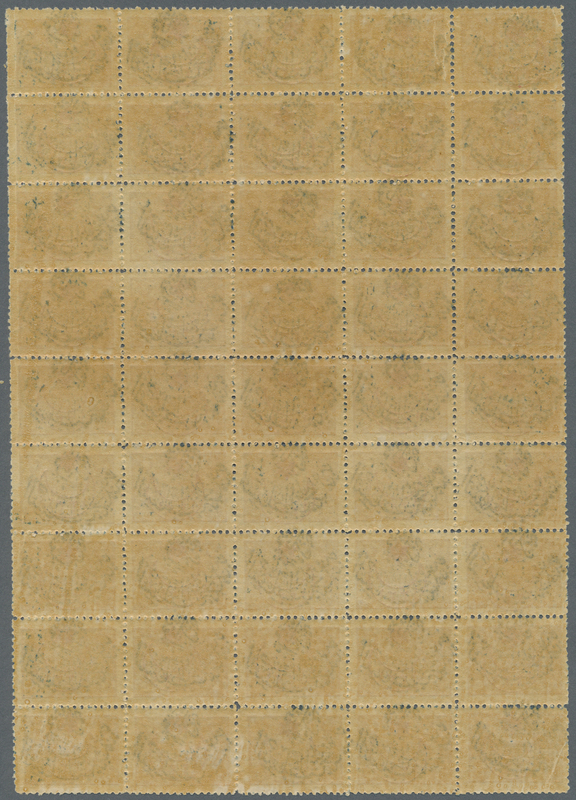 9605 ungebraucht (hinged) * 1/12U 1934, proclamation of King Ibn Saud set, imperforated, unused mounted mint first mount LH, 10 G gum crease, 20 G. signed Stolow (SG 316/27, Scott 138/49).